Senior Laboratory Engineer, Sara Bucht, is shown here with the grism stretcher that she designed and built, which uses gratings mounted next to prisms to form "grisms." The grism stretcher is used to manipulate the temporal profile of OPAL (optical parametric amplifier line) in order to compress the typically discarded idler pulse. To stretch the pulse to almost a nanosecond pulse duration, large custom optics are used, which resulted in a daunting design process requiring navigation through a parameter space involving 11 total variables. The inset shows the prism with the grating. Neutron spectroscopy is a primary diagnostic technique for inertial confinement fusion research on the OMEGA Laser System. Neutron time-of-flight (nTOF) spectrometers having a high signal dynamic range are used routinely on OMEGA to infer the stagnated core conditions of laser direct-drive DT cryogenic implosions, such as the primary neutron yield, the average ion temperature, the compressed areal density, and hot-spot flow velocity. Three orthogonal lines-of-sight (LOS's) are necessary to observe and diagnose the multidimensional effects on hot-spot formation. The second of three shielded and collimated LOS’s was commissioned in November 2018. It penetrates the OMEGA and OMEGA EP shield walls and is further collimated by a 1-m-long polyethylene tube. The end of the white collimator tube can be seen in the background of the photograph above. The collimation and shielding were designed with a neutron transport code to minimize neutron scattering from the OMEGA target chamber and surrounding support structure. The two nTOF spectrometers, shown in the foreground, are positioned about 22 m from the OMEGA target chamber center (TCC). The collimated neutron beam propagates through the first nTOF spectrometer (see the narrow black strip in front of the stainless-steel housing in the photograph), consisting of a small plastic scintillator (5.0 cm × 5.0 cm × 0.5 cm) coupled to a single photomultiplier tube (PMT), and then propagates through the second nTOF spectrometer (see the stainless-steel housing in the photograph), consisting of a liquid crystal scintillator (oxygenated xylene) coupled to four PMT's. The collimated neutron beam does not interact directly with any of the PMT's. These nTOF spectrometers are similar to those in the first LOS, which has been operating on OMEGA 13.4 m from TCC along the TIM-6 axis in LaCave since 2012. A third LOS is planned for 2020. In collaboration with LLE and several other institutions, recent Ph.D., Hong Sio, and Senior Scientist, Johan Frenje of MIT, each published an article in the January 2019 Physical Review Letters for work done under the NLUF program. Hong's experiments conducted at the Omega Laser Facility, which included the development of the PXTD (particle-x-ray temporal diagnostic) with LLE colleagues, showed that different nuclear burn histories of a shock-driven implosion could only be explained by including multi-ion physics. Johan's work, which also utilized PXTD, provided the first detailed measurements of ion stopping around the Bragg peak in HED Plasmas. The PXTD has been utilized in several other campaigns on OMEGA, and a new version, cryo PXTD, is now under development in a collaboration between MIT and LLE. MIT and LLE have been collaborating together for nearly three decades. 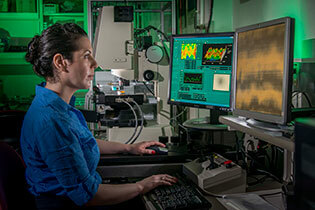 Pia Valdivia, Johns Hopkins University Research Scientist, is shown aligning the Talbot–Lau x-ray deflectometer for use in a National Laser Users' Facility experiment to benchmark the ten-inch manipulator (TIM)–based diagnostic on OMEGA EP (EP-TXD). The interferometer can map electron density gradients in high-energy-density physics experiments. The experiment aimed to characterize irradiated foils by mapping the ablation front for electron density values above critical density. Several female scientists attending the NIF/JLF User Group Meeting 3–6 February 2019 at the Bella Rosa Event Center in Livermore, CA welcomed a surprise visit by the 2018 Nobel Laureate in Physics Professor Donna Strickland to orchestrate a photo-op to celebrate her achievement. Professor Strickland was joined by female representatives from over ten international institutions including Dr. Patricia Falcone, the Deputy Director for Science and Technology at Lawrence Livermore National Laboratory (LLNL), and Dr. Mingsheng Wei, the National Laser User Facility Manager at LLE. The represented institutions included scientists from General Atomics, Johns Hopkins University, Los Alamos National Laboratory, LLNL, Massachusetts Institute of Technology, University of California, San Diego, University of Michigan, and the Universität Rostock in Germany. 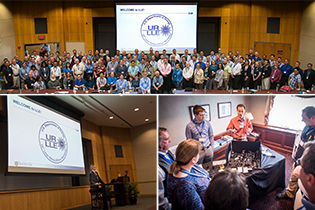 The annual NIF/JLF User Group Meeting attracts over 180 participants from around the globe. The goal of the meeting is to describe the capabilities of the NIF and JLF to current and potential users and included presentations with highlights from recent experiments. 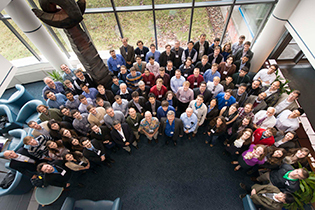 NNSA provided travel support for students and postdoctoral researchers to attend the meeting. Dr. Kevin Fournier, Director of the NIF User Office, took note of the gathering of the female scientists, saying "it's a testimonial to the strongly inclusive approach we try to take in our HEDP community." This is one of the early prototypes of the neutron time-of-flight (nTOF) diagnostics at the National Ignition Facility that used a new type of crystal known as Bibenzyl. To minimize neutron scattering from the scintillator housing, this detector was designed using a neutron transport code (Monte-Carlo neutron particle). This is one of the reasons for the forward-swept light-guides attached to the PMT housing. In December, it was fielded to test a new type of crystal called DPAC, and again in January to record x rays from a joint shot day. The 13th National Diagnostic Working Group (NDWG) Meeting was held at LLE on 5–6 December 2018. The NDWG was formed by the Inertial Confinement Fusion and the High-Energy-Density Physics research communities to enhance national coordination between the labs to develop advanced diagnostics. Diagnostic experts from LLE, Lawrence Livermore National Laboratory (LLNL), Los Alamos National Laboratory, Sandia National Laboratories (SNL), the Naval Research Laboratory, Nevada National Security Site, the Plasma Science and Fusion Center at MIT, Princeton Plasma Physics Laboratory at Princeton University, Johns Hopkins University, General Atomics, Kentech Instruments Ltd., Sydor Technologies, Artep Inc., Photek, Commissariat à l'Énergie Atomique et aux Énergies Alternatives, Atomic Weapons Establishment, and the Extreme Light Infrastructure-Nuclear Physics participated in the two-day meeting. The NDWG has the specific goal to advise the Department of Energy's National Nuclear Security Administration and the facility management of the National Ignition Facility at LLNL, the Z machine at SNL, and the Omega Laser Facility at LLE on diagnostic priorities, plans, and schedule. Graduate Student, Alison Christopherson, has been awarded the 2019 Laser and Particle Beams Young Scientist Award for research that she presented at the 39th International Workshop on High Energy Density Physics with Intense Ion and Laser Beams in Hirschegg, Austria. The journal awarded Alison with 2000€ to attend an international physics conference. Christopherson is a Ph.D. candidate in the University's Department of Mechanical Engineering studying under Prof. Riccardo Betti. Professor Gilbert "Rip" Collins was installed as a Dean's Professor by Wendi Heinzelman, Dean of the Hajim School of Engineering and Applied Sciences. Collins was bestowed this distinguished honor in a ceremony also attended by University President Richard Feldman and Dean of Arts, Sciences and Engineering, Gloria Culver, on Tuesday 29 January. Professor Collins joined the Dept. of Mechanical Engineering in the Summer of 2016, with secondary appointments in Physics and Astronomy and LLE. He has established a prominent research program on the physics and materials science of how high-energy densities alter the properties of materials, which has applications in high-strain-rate phenomena, planetary science, stellar evolution, and controlled fusion. Rip has led an expansive UR effort for the first-of-its-kind international curriculum on high-energy-density science, and has also been instrumental in attracting to UR prominent young scientists, enhancing diversity and national recognition. Maia Raynor and Anirudh Sharma have been designated as Scholars in the prestigious Regeneron Science Talent Search for research projects they carried out last summer at LLE. Maia, shown above middle with her advisors, Walter Shmayda and Cody Fagan, is a senior at Brighton High School. She investigated the use of a copper-zinc alloy to remove elemental hydrogen from air, providing a simplified method of reducing tritium emissions to the environment. Anirudh, shown bottom right with his advisor and High School Program Director Stephen Craxton, is a senior at Webster Schroeder High School. 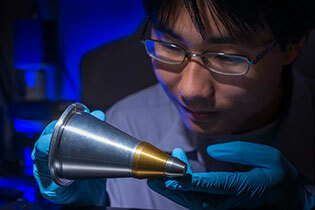 He carried out hydrodynamic simulations of a new "double cone-in-shell" target concept for an improved x-ray source at the National Ignition Facility. A total of 38 students from the LLE program have now become Scholars since the program's inception in 1989. The LLE program provides a unique educational opportunity for talented and motivated high school students. Application materials for the 2019 program will be available here in early February. Additional information on the Regeneron Science Talent Search can be found here, and a feature about the High School Program can be found on the University website. The American Physical Society's (APS) Committee on Education has recognized the State University of New York (SUNY) at Geneseo for excellence in undergraduate physics education and supporting best practices in education. "Students are attracted to the physics department at SUNY Geneseo by the outstanding faculty, high-quality facilities, and the supportive 'family atmosphere' that prepare students for successful and challenging careers," reports APS. SUNY Geneseo and LLE have enjoyed a dynamic and enduring partnership for over 20 years, during which time approximately 320 full-time equivalent summer Research Assistants from Geneseo have worked on ICF and HEDP projects. 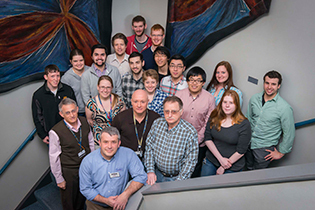 The partnership between Geneseo and LLE makes it possible for undergraduate students to participate in significant research and collaborate with scientists at world-class inertial confinement fusion/high-energy-density facilities, including the Omega Laser Facility. Here, future SUNY Geneseo research assistants and LLE staff pose for a picture before an introductory tour of LLE. John Lambropoulos, LLE Senior Scientist and University Professor and Chair, Department of Mechanical Engineering, has been awarded the 2018 Goergen Award for Excellence in Undergraduate Teaching. At LLE, he has studied the optimization of optics manufacturing techniques and developed experimental techniques to measure the thermal conductivity of thin films and has also expanded on models to correlate thin-film thermal conductivity with the film microstructure. In addition, he has participated as speaker and advisor in LLE's high school program. Shown is his seminar to high school students entitled Glass Fracture, Starting with Galileo. Robert Henchen (Ph.D., 2018) aligns the all-reflective imaging Thomson-scattering telescope, shown with its cover removed, which collects and collimates Thomson-scattered light. 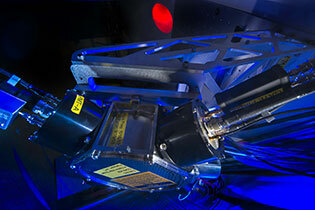 It is transported to an instrumentation cart where it passes through a spectrometer and streak camera, shown behind in blue, to provide time- and spectrally resolved measurements of plasma conditions. With this instrument, nonlocal heat flux was measured using Thomson scattering from electron plasma waves. The relative amplitudes of Thomson-scattering features were affected by changes to the electron distribution function caused by temperature gradients. Time-resolved Thomson-scattering spectra from electron plasma waves are shown, in the inset, at three locations in the plasma. For more information, see LLE Review 155. 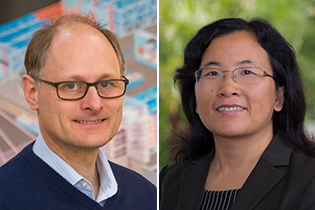 Senior Scientist Wolfgang Theobald, a member of the Omega Experiments group, and Mingsheng Wei, Manager of the National Laser Users Facility, were each elected to Fellowship of the American Physical Society (APS). Fellowship is a distinct honor for each of the recipients as it is conferred by their peers in recognition of outstanding scientific achievement. No more than one half of one percent of the APS membership is elected to Fellowship annually. 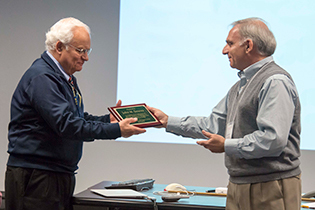 Wolfgang was recognized for "pioneering experiments and seminal contributions in suprathermal electron generation and transport in laser-driven inertial confinement fusion plasmas including fast-ignition and shock-ignition implosions." Mingsheng was recognized for "contributions to the field of experimental high-intensity laser–plasma interactions and in particular for improved understanding of hot-electron transport with regard to applications such as fast-ignition fusion and ion acceleration." A large-scale crane was recently employed at LLE to move materials required for the second line-of-sight neutron shield and to aid with a cooling tower repair. 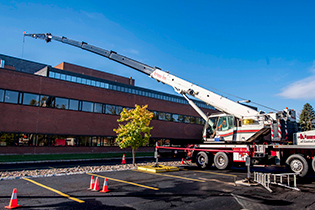 The crane mast was 199 feet long and needed to span 176 feet to the drop point on the roof. It used over 40,000 lbs of ballast weight to counter the weight of the long mast, and it had a maximum lifting capacity of 100 tons. The size of the crane and its proximity to the airport required a Federal Air Administration permit and special clearance had to be approved with the airport control tower just prior to the lift. Dr. Andrey Okishev passed away unexpectedly at age 59 on November 5, 2018. 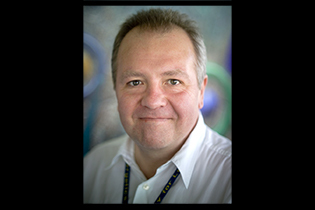 Dr. Okishev joined LLE in 1993 as a Research Associate and left as a Senior Scientist in 2014. During these 21 years, Andrey designed and built a number of unique and extraordinarily reliable lasers known as Omega master oscillators, diode-pumped regens, the damage-test laser and others. Dr. Okishev is the author of over 100 scientific papers. 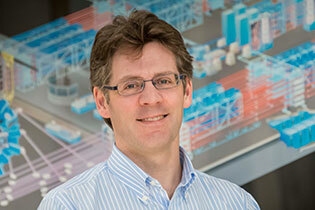 His contributions to the OMEGA and OMEGA EP lasers underpin the reliability and flexibility of these large-scale lasers. Tens of lasers built by Andrey are still running in a number of systems in use at LLE. Among the scientists and laser engineers at LLE, these stand as a lasting memory and testament to the technical acumen of Dr. Andrey V. Okishev. New light pole banners are going up across the University of Rochester promoting the new marketing campaign "The Rochester Effect." Shown is one at LLE's east entrance. "Delivering 40,000 joules per billionth of a second for energy ever better," says the banner which highlights the inside of the OMEGA EP target chamber prior to its final installation with Amy Rigatti, Group Leader for the Optical Manufacturing Shop, illustrating scale. Now in its 30th year, LLE's Summer High School Research Program continues to maintain its goal of exciting high school students about careers in the areas of science and technology by exposing them to research in a state-of-the-art environment. The program, directed by Dr. Stephen Craxton for the past 21 years, has an impressive record of 377 students, many of whom have gone on to receive post-graduate training in a variety of fields from physics to medicine. Shown are four recent students with their projects. In the upper left is Steven Booth (Brighton High School), advised by Wade Bittle and Vinitha Anand, with a power-conditioning-unit circuit board of the type used on OMEGA and OMEGA EP. In the upper right is Katie Kopp (Victor High School), advised by Stavros Demos, displaying frog kidney structures using the MUSE (microscopy with ultraviolet surface excitation) technique developed originally to assess damage to laser optics. In the lower left and advised by Walter Shmayda and Cody Fagan is Maia Raynor (Brighton High School) with a setup that investigates hydrogen oxidation over a copper alloy. In the lower right is Hannah Lang (Rush Henrietta High School), advised by Ken Marshall, shown in front of a computationally generated molecular model of an azobenzene photoswitchable alignment material being investigated for use in an optically addressable liquid crystal beam shaper. The collaboration, which includes University of Texas at Austin, Ohio State, Colorado State, Michigan, Nebraska-Lincoln, SLAC National Laboratory, Lawrence Berkeley National Laboratory, and Lawrence Livermore National Laboratory, will provide U.S. scientists increased access to high-intensity, ultrafast lasers like the OMEGA EP at the LLE. The LaserNetUS Initiative is funded by the U.S. Department of Energy’s Office of Fusion Energy Sciences within the Office of Science and will receive $6.8 million over the next two years. LaserNetUS will hold a nationwide call for proposals for access to the network's facilities. The proposals will be peer reviewed by an independent proposal review panel. This call will allow any researcher in the U.S. to get time on one of the high intensity lasers at the LaserNetUS host institutions. Profs. Donna Strickland and Gérard Mourou were awarded the 2018 Nobel Prize in Physics "for groundbreaking inventions in the field of laser physics" for their invention of chirped-pulse amplification (CPA) while at the University of Rochester’s Laboratory for Laser Energetics in the 1980s. Prof. Strickland developed CPA as a graduate student with Prof. Mourou as her advisor in The Institute of Optics. Strickland is only the third woman to receive the prize in physics, joining Marie Curie (1903) and Maria Goeppert-Mayer (1963). "We need to celebrate women physicists because we’re out there," Strickland said. "I am honored to be one of those women." Professor of Optics and former Institute of Optics Director, Wayne Knox said of Gérard Mourou, he is "one of the most visionary and creative people I’ve met in my whole life. He was always thinking about the next power of 10. If his laser was making 1018 watts per square centimeter, he wanted to build one that was a thousand times bigger." Together, their invention revolutionized laser science, enabling amplification of ultrashort laser pulses by more than five orders of magnitude (see diagram above). Sean Regan, Senior Scientist and Group Leader, Omega Experiments, has been selected as a recipient of the Fusion Power Associates (FPA) 2018 Leadership Award. This prestigious award is presented to individuals demonstrating outstanding leadership qualities in accelerating the development of fusion. Sean is especially recognized by the FPA Board for his scientific contributions provided to the experimental program at the Omega Laser Facility and his leadership provided to the national fusion program in his important role as Co-Chair of the National Implosion Stagnation Physics Working Group. Sean will receive his award at the FPA's Annual Meeting and Symposium, 4–5 December 2018. The tunable OMEGA P9 beam (TOP9) is being used to develop a CBET platform and explore multicolor cross-beam energy transfer (CBET) mitigation strategies using a wavelength tunable (1‑nm), 351‑nm UV beam at the Omega Laser Facility. As part of the large infrastructure needed to propagate that beam, a custom long-radius test bench was designed to determine the focal length of the TOP9 relay lens. Shown is Senior Laboratory Engineer, Sam Agnello, working on the system. Streak cameras are used extensively at LLE to measure light intensity with respect to time. Their accuracy depends on properly calibrating their timing. The comb pulse generator was created in-house to accommodate the many streak camera detectors used on high-energy-density plasma experiments. Designed and assembled by the Electronics and Controls Engineering Group, this instrument is a fiber optic, 680-nm comb pulse generator capable of operating up to 5 GHz, or 200‑ps pulse spacing. The output pulses are nearly Gaussian with a full width half maximum of approximately 50 ps and peak power of 5 mW. 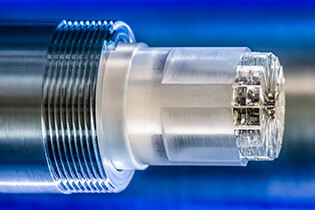 The rate can be doubled to 10 GHz using a passive optical doubler also developed at LLE. Three other repetition rates can also be selected, including 0.5, 1.0, and 2.5 GHz. Danae Polsin, a graduate student in the High-Energy-Density Physics Experiments Group, assembles a powder x-ray diffraction image-plate (PXRDIP) target for a Laboratory Basic Science campaign day she was awarded this year. The objective is to compress sodium into an unexplored pressure regime (5 Mbar) to provide definitive experimental evidence for the electride state and to determine the high-pressure melting behavior in sodium using x-ray diffraction and optical reflectivity measurements. These experiments obtained the highest-pressure structural and electronic properties data for an alkali metal, a prototypical system used to guide theory for ultradense matter beyond the Thomas–Fermi model. More than 80 percent of planets are composed of metallic hydrogen. However, metallic hydrogen is one of the rarest materials found on Earth. Mohamed Zaghoo, Research Associate, and Gilbert 'Rip' Collins, Associate Director for Academics, Science, and Technology, have studied the conductivity of metallic hydrogen using experiments on the Omega Laser System to understand how planets form magnetic fields. Jupiter has one of the strongest magnetic fields in our solar system, and the "dynamo" mechanism that causes this is also present deep within the Earth. This dynamo creates our own magnetic field, making our planet habitable by shielding us from harmful solar particles. 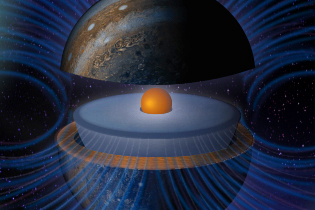 A key to Jupiter's magnetic field may lie in understanding the properties of metallic hydrogen, which surrounds Jupiter's core. More information is available in the recently published article in The Astrophysical Journal, and in on the University website. Graduate Student Alison Christopherson had an opportunity to meet with Senator Kirsten Gillibrand at a Rochester Town Hall Meeting held by Senator Gillibrand at Monroe Community College on July 20th. Christopherson is a Ph.D. candidate in the University's Department of Mechanical Engineering studying under Prof. Riccardo Betti. She is working on inertial confinement fusion focused on the physics of ignition. Senator Gillibrand has been a great supporter of the lab and an advocate for federal investment in LLE. Collin Stillman (Ph.D. 2018) is shown configuring a Hall-geometry crystal spectrometer that he built during his graduate work to measure thermal x-ray emission from dense, high-temperature plasmas created by rapidly heating solid matter with high-intensity laser pulses. The Hall geometry employs a conically curved crystal to spectrally disperse and focus x rays emitted by the plasma along the input slit of an ultrafast streak camera, pictured in the background. The temporally and spectrally resolved x-ray data are studied to infer the atomic, radiative, and material properties of hot dense matter at conditions similar to those of the solar interior. The measurements show how atomic energy levels are modified in dense plasmas in order to understand energy transfer dynamics in nonequilibrium systems. John Soures, Manager of the National Laser Users Facility and Laser Basic Sciences, received recognition from the Omega Facility Users Group with a plaque given to him by the Steering Committee chair, Roberto Mancini, at the annual meeting. Shown is Experimental System Technician Dan Neyland changing filtration in front of the charge-injected–device (CID) cameras in the gated monochromatic x-ray imaging (GMXI) diagnostic. Filtration is used to set the level of x rays going to the imaging camera in order to capture data in a specific spectral range with optimal signal-to-noise ratio. The GMXI module, highlighted in red, consists of two rotary stages, each of which positions a crystal turret-framing module pair. The crystal turrets, each containing two crystals, are positioned at the desired Bragg angle (θB), while the framing modules are positioned at the diffracted image plane. 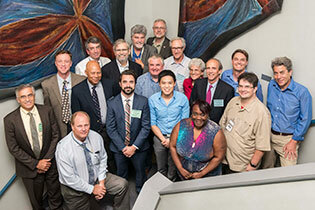 The U.S. Department of Energy (DOE) Laser Safety Officer (LSO) Workshop for individuals with responsibility for laser safety in a research or academic setting was recently hosted at LLE. This 2.5-day workshop included both invited and contributed talks on current laser applications and associated laser safety issues and solutions. The final day of the workshop served as the official meeting of the DOE Energy Facility Contractors Group Laser Safety Task Group. Additionally, the Board of Laser Safety also offered its Certified LSO examination and the American National Standards Institute's (ANSI) Accredited Standards Committee on Laser Safety met at the workshop. On Saturday 9 June, LLE employees rode their bikes in the American Diabetes Association's Tour de Cure. Team LLE rode a combined 1,000 miles and raised over $9,000. Team LLE is one of five teams from the University of Rochester. Together, the five University teams raised over $35,000 and are the #2 fundraising corporate team in this year's event. Tour de Cure fundraising directly supports research, education, and advocacy for people living with type 1, type 2, and gestational diabetes. The Tenth Omega Laser Facility Users Group Workshop, held 25–27 April 2018, attracted about 130 researchers from around the world. The workshop facilitates a continuing dialog among the individual users and between the users and LLE. Most of the contributed posters were given by students and postdocs in attendance (shown in inset). The eleventh OLUG workshop will be held 24–26 April 2019. Safety is a priority at LLE. Shown above, top, LLE facilities Manager, John Sawyer, Tyler Critelli, a co-op student from the Rochester Institute of Technology, and Chemical Safety Officer, Ken Marshall, flush the emergency shower in the mechanical room as part of a periodic testing procedure that helps clear the supply lines of sediment and bacteria build-up that is caused by stagnant water. Proper maintenance, regular testing, and visual checking are necessary to ensure that emergency showers and eyewash stations function safely and properly. 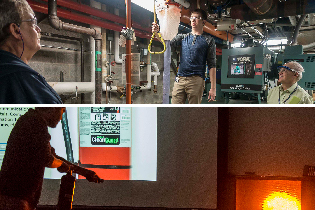 Shown above, bottom, Research Associate Jonathan Peebles takes part in an on-site fire-fighting safety class through the University's Fire Safety Unit and coordinated by LLE facilities manager, John Sawyer. Here, a zero-chemical-emission, hands-on fire extinguisher is used to asses the pointing and sweeping accuracy of the user. Additional information Safety at LLE, see LLE's Safety Zone website. 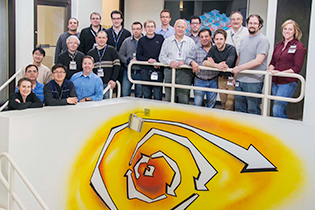 The Magnetic Fields in Laser Plasmas Workshop was held 23–24 April at LLE as a satellite meeting to the Annual OMEGA Laser Users' Group meeting (OLUG). Presentations given at the workshop can be found here. 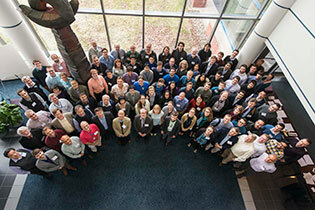 The meeting served to bring together those working on laser experiments and simulations with imposed magnetic fields to discuss the state-of-the-art, outstanding physics issues, future directions, and collaborations at a time of expanding opportunities. There were 36 external attendees, from 21 different institutions in 6 different countries: the U.S. (29 attendees), Canada (1), the UK (1), Japan (2), France (2) and Spain (1), demonstrating the worldwide interest in this growing area of research. As most of you are aware, Dr. John Soures retired from his full time position as Senior Scientist, NLUF Manager and Coordinator of External Users of the Omega Facility as of 30 April 2018. The Laboratory conducted a national search for replacement candidates and after a several month long effort, extended an offer to Dr. Mingsheng Wei, currently employed at General Atomics in San Diego, California. I am pleased to announce that Mingsheng Wei has accepted our offer to become LLE's National Laser Users' Facility Program Manager. In the interim period until Dr. Wei joins our staff mid-August 2018, Dr. Soures will continue as Acting Manager of the NLUF Program and as Acting Coordinator of the Omega Facility on a time-as-reported basis. Mingsheng brings with her many years of experience as a user of the Omega Laser Facility. She additionally brings experience in a leadership position in the Omega Laser Facility Users Group Executive Committee. These experiences give her a complete picture of the Omega User experience. She will serve the NLUF community well in her new role. Dr. Wei has mentored graduate students, postdoctoral researchers, and junior scientists over the last 13 years of her career. Her research in the fields of nonlinear laser–plasma interaction and high-energy-density physics is an invaluable asset toward the success of the NLUF and Laboratory Basic Science (LBS) programs at LLE. She brings a wealth of knowledge with her from experiments she has conducted at many U.S. facilities as well as those in other areas of the world. Mingsheng received her Ph.D. degree in Laser Plasma Physics from Imperial College, London, in 2005. From 2005 to 2010 she was Project Scientist at the Center for Energy Research, UC San Diego. In 2010 Dr. Wei joined the Inertial Fusion Technology Division of General Atomics, San Diego, where she currently serves as Senior Scientist and Principal Investigator, leading research in the area of high-energy-density physics and inertial confinement fusion. She also interfaces with national labs and academics on GA's target fabrication. She has approximately 100 journal publications including Nature Physics and Physical Review Letters among others. Her work has received more than 3800 citations with an H-index of 32. Please welcome Mingsheng in her new position at LLE. We, as a community, are fortunate to have her appointed to this important position. Record-Breaking Laser Experiments Simulate Cores of "Super Earths"
Experiments at LLE have yielded the highest-pressure x-ray diffraction data ever recorded in order to simulate the conditions inside a planet three-times as large as earth, or "super-Earth." These results are significant because they allow scientists to perform direct experiments to test the possible structure and composition of super-Earth planets. The experiments yielded presssures up to 13 million times the atmospheric pressure on Earth, which is three times higher than previous experiments, and provide a notable contribution to exoplanet research. A recent Princeton press release details the results of these experiments, which were published in Science Advances. Two new features were recently introduced to the LLE website to increase functionality and user experience. The first is the LLE Virtual Tour. The Virtual Tour is an interactive experience that allows you to navigate through the lab and experience areas of the building that you would be generally otherwise unable to access, such as inside of the Laser and Target Bays. This tour is a great outreach and teaching tool and enables a greater understanding of the inner workings of the building. Shown installing the upgraded Linear Induction Motor (LIM) in the OMEGA Target Bay is Tom Lewis, Dan Neyland (running the crane), Chad Abbott, and CodyShane Taylor. The replacement linear motor assembly replaces the original unit that was put into service in 2001. The LIM is used as the retractor for the shroud that maintains targets at cryogenic temperatures. The LIM control system also underwent complete replacement with the installation of two new control panels. The upgraded LIM has been in the development for the past fours years and was previously featured in a Past Quick Shot on 07/11/16. An echelon is an optic consisting of a series of rectangular mirror elements arranged in a staircase pattern. It can be used for a number of applications, including calibrating ultrafast streak cameras. The mirrored elements divide a single laser pulse into a series of temporally delayed segments. Shown is Research Engineer, Joe Katz, constructing such an echelon using a UV source to glue an additional mirror to the assembly. The orientation of the mirrored surfaces is monitored in real time to confirm their alignment while they are fixed in place with UV-cured optical cement. Additionally, an echelon can be used to correct large-scale pulse-front tilt introduced from a diffraction grating while maintaining angular dispersion. When used in a spectrometer, an echelon can compensate for path-length differences, allowing for picosecond time resolution with large-aperture beams. The optic was ground, polished, coated, assembled, and metrologized in-house at LLE. As part of the National Laser Users' Facility program, The Massachusetts Institute of Technology (MIT), Luxel Corp., and General Atomics designed and built a new gas-bag platform to study fundamental astrophysical phenomena, including the propagation, interaction, and instability of astrophysical jets and plasma shocks. The resulting data will provide insights into and advancement of fundamental issues surrounding frontier astrophysics and basic high-energy-density physics. The goal of MIT's experiments at LLE will be to generate a magnetized collisionless shock by driving a supersonic plasma flow into the pressurized gas-bag in the presence of external magnetic fields. 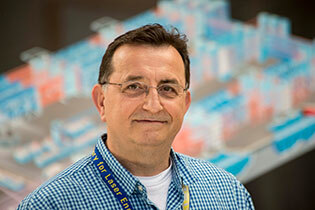 Stavros Demos, Optical Materials Group Leader, was elected a Fellow by the Board of Directors of The Optical Society (OSA). 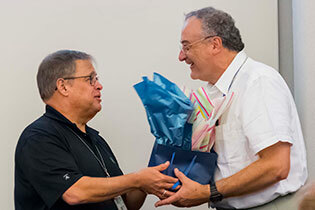 He was recognized "for pioneering and sustained contributions to understanding dynamic behaviors and improved performance in optical materials for high power lasers and developing multimodal imaging and characterization methods for medical and other applications." This award recognizes distinguished scientific achievement in the OSA. Demos was also selected as a Fellow of the American Physical Society in 2015 for his "outstanding contributions using unique optical techniques to understanding the relaxation dynamics of point defects and developing non-invasive biomedical photonics for rapid tissue assessment" for work he completed while at Lawrence Livermore National Laboratory. On 5 February, the New York Times Science section posted an article that features an experiment that was conducted at the Omega Laser Facility under the LLE Laboratory Basic Science Program and was recently published in the journal Nature Physics. The paper discusses a new "strange" form of water that is simultaneously solid and liquid. The paper highlights experiments conducted by a team comprised of scientists from Lawrence Livermore National Laboratory (LLNL), the University of California Berkeley, and the University of Rochester and led by Marius Millot, a physicist at LLNL. This new form of water is called "superionic water" and is not known to exist naturally on Earth. Scientists created it by squeezing water between two pieces of diamond to create a type of ice that is about 60% denser than usual. Then, on the OMEGA Laser System, a pulse of laser light was used to heat the ice to thousands of degrees to exert a pressure more than a million times that of Earth's atmosphere. These conditions exist inside Uranus and Neptune and undoubtedly within numerous ice giants around other stars. A solicitation for proposals for the FY19 Laboratory Basic Science Program is currently underway. 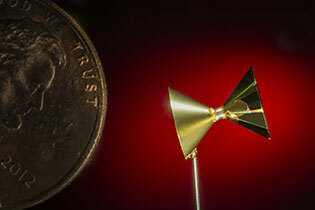 An advanced focusing scheme has enabled a small-diameter laser focus to propagate nearly 100× its Rayleigh length. This technique removes the need for long-focal-length systems or guiding structures to maintain high intensities over long distances and decouples the velocity of the focal spot from the group velocity of the light. This research is presented in LLE Review volume 151 and can be read in its entirety here. The photo shows a schematic of the chromatic focusing system coupled to a spectrally chirped laser pulse used to generate the "flying focus," the name given to this advanced focusing scheme. Providing unprecedented spatiotemporal control over the laser focal volume allows the laser focus to co- or counter-propagate along its axis at any velocity. The article on flying focus is authored by Dustin Froula (shown in the image), David Turnbull, Andrew Davies, Terrance Kessler, Daniel Haberberger, Seung-Whan Bahk, Ildar Begishev, Robert Boni, Sara Bucht, Joe Katz, Jessica Shaw, and John Palastro. Nikhil Bose and Yujia Yang have been designated as Scholars in the prestigious Regeneron Science Talent Search for research projects they carried out last summer at LLE. Bose, shown above right with his advisor, Mark Guardalben, is a senior at Pittsford Sutherland High School. 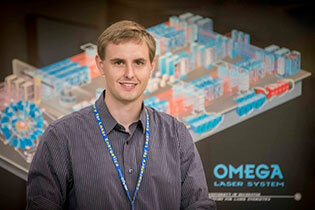 He developed a simulation model to explore a novel method for improving the performance of LLE's OMEGA EP laser. 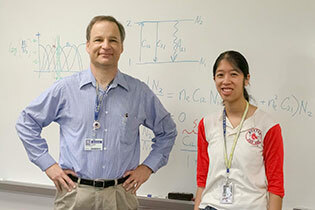 Yang, shown bottom right with her advisor and high-school program director Stephen Craxton, is a senior at Brighton High School. She carried out hydrodynamic simulations of a new fusion concept for the National Ignition Facility known as "Revolver." Only 300 students nationwide are selected as scholars from over 1,800 entrants. The students have a chance to be included among the 40 finalists chosen to attend the week-long, all-expenses-paid Science Talent Institute in March in Washington, DC, to compete for college scholarships. A total of 36 students from the LLE program have now become Scholars since the program's inception in 1989. "Our program provides a unique educational opportunity for talented high-school students. They're amazingly motivated, and it's exciting to see them recognized as among the best in the nation," said Stephen Craxton. Application materials for LLE's next summer program will be available here in February. Four LLE senior scientists received Fusion Power Associates (FPA) awards for 2017. 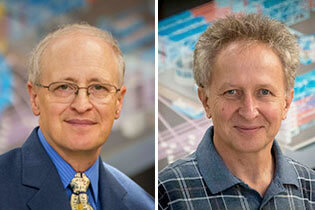 Theory and Experimental Division Directors, Valeri Goncharov and Craig Sangster, respectively, jointly received the Leadership Award; former Director (retired) and University Professor Emeritus Robert McCrory received the Distinguished Career Award; and Assistant Professor Adam Sefkow received the Excellence in Fusion Engineering Award. FPA is a nonprofit research and educational foundation, providing timely information on the status of fusion development and other applications of plasma science and fusion research. Since 1996, LLE scientists have received eight FPA awards. High-energy ultraviolet sources are required to probe dense, hot plasma from fusion experiments using Thomson scattering because there is less self-generated background from the plasma in the 180- to 230-nm spectral region. The fifth harmonic of neodymium glass lasers has a wavelength of 211 nm, which matches this spectral "window." This high-energy application requires a large beam (~10 × 10 cm) and only a few nonlinear crystals suitable for frequency conversion can be grown sufficiently large. Although scientists working at LLE and LLNL have recently demonstrated 30% conversion efficiency in cesium lithium borate (CLBO), such crystals are extremely expensive and must be heated in an oven to avoid hygroscopic damage. Recent work has examined ammonium dihydrogen phosphate (ADP), which can be grown inexpensively in large sizes, but must be cooled to –70°C (or 200 K) for fifth-harmonic generation, with a precision of 0.1 K. LLE has developed a two-chamber cryostat that uses liquid nitrogen to cool an internal chamber that contains the crystal along with helium gas at a pressure of 1 atm for uniform cooling. Shown in the Laser Technology Development Laboratory at the cryostat chamber is Research Engineer Ildar Begishev, along with the insert that shows a view of the square crystal through the cryostat. The University of Rochester's Board of Trustees approved the appointment of Dr. E. M. Campbell as the new Director of the Laboratory for Laser Energetics. Dr. Campbell is an internationally known expert in inertial fusion, high-energy-density physics, high-power lasers and their applications, and advanced energy technologies including Generation IV nuclear fission reactors and biofuels. He has won numerous awards including the Department of Energy's E. O. Lawrence Award, the American Nuclear Society's Edward Teller Award, the American Physical Society's John Dawson Award, the Department of Energy's Excellence in Weapons Research Award, and the Leadership Award of Fusion Power Associates. He is a Fellow of the American Physical Society and the European Institute of Physics. He has published over 100 articles in scientific journals and holds five patents including the design of the first laboratory x-ray laser. He has given numerous invited and plenary talks at both national and international conferences. He is the originator of the Inertial Fusion Science and Applications Conference. LLE hosted the 11th International Laser Operations Workshop (ILOW) on 26–28 September, and the 5th National Implosion Stagnation Physics Workshop on 27–28 September. The objective of the ILOW workshop is to optimize the productivity and efficiency of the large laser facilities worldwide, which improves the quality, quantity, and breadth of scientific research performed at these facilities. Scientists and engineers from the following facilities attended: the National Ignition Facility (NIF) at Lawrence Livermore National Laboratory (LLNL), the Orion Facility and the Rutherford Appleton Laboratory of the United Kingdom, the Laser Mégajoule (LMJ) and LULI facilities of France, the three Extreme Light Infrastructure sites (ELI) of the Czech Republic, Hungary and Romania, the Z backlighter facility at Sandia National Laboratories (SNL), the Stanford Linear Accelerator Center at Stanford University in California, and the Texas Petawatt System at the University of Texas at Austin. The 5th National Implosion Stagnation Physics Workshop was co-chaired by LLE Senior Scientist, Sean Regan and MIT Research Scientist, Johan Frenje, who stated that, "The overarching goal of the NISP effort is to substantially advance our understanding of the physics of the stagnation process and state of the fuel and ablator near and at stagnation." Scientists from LLE, Imperial College London, Massachusetts Institute of Technology, General Atomics, SNL, University of Nevada-Reno, Los Alamos National Laboratory, LLNL, and the Naval Research Laboratory participated in the workshop. Senior Research Engineer, Ken Marshall, and Research Engineer, Ildar Begishev, were chosen as Senior Members by the Board of Directors of The Optical Society of America (OSA). This distinction provides well-established individuals recognition for their experience and professional accomplishments within the field of optics and photonics. The OSA is the leading professional home to 270,000 accomplished scientists, engineers, students, and entrepreneurs. MIT collaborative partners Drs. Rich Petrasso, Chikang Li, and Fredrick Séguin (pictured above) have been named recipients of the 2017 John Dawson Excellence in Plasma Physics Award from the American Physical Society. The award is in recognition of their "pioneering use of proton radiography to reveal aspects of flow, instabilities, and fields in high-energy-density plasmas." Three other recipients were nominated with the MIT scientists for the award—Dr. Andrew Mackinnon (LLNL), Professor Marco Borghesi (Queen's University, Belfast), and Professor Oswald Willi (Heinrich Heine University, Dusseldorf). Much of the pioneering work performed by the MIT scientists was done on the OMEGA 60 laser beginning in the early 2000s. 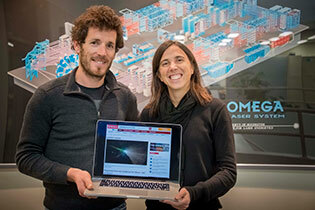 The techniques developed by the winning team are now common at Omega and the National Ignition Facility and science enabled by their pioneering discoveries have been reported in dozens of papers in journals such as Nature, Science, and Physical Review Letters. 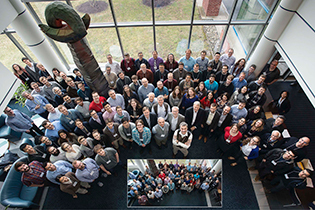 In acknowledging this award, Professor Dennis Whyte, the Director of the Plasma Science and Fusion Center at MIT writes, "What strikes me here is that, besides the clearly outstanding science involved, the Award acknowledges the power of a deep and collaborative partnership between a University group and a national-scale laboratory like LLE. It is evident that a well-nurtured partnership is mutually beneficial, and can also expand the impact of the research." Dr. Michael Campbell, the Director of LLE commented similarly on the close cooperation between MIT and LLE: "This prestigious award recognizes the outstanding research done by the scientists at MIT and their collaborators at LLNL, Queen's University, and Heinrich Heine University, Dusseldorf. These scientists have been exceptional partners with LLE in research, training, and education for more than two decades. The Laboratory is very pleased to see this recognition by the APS-DPP." 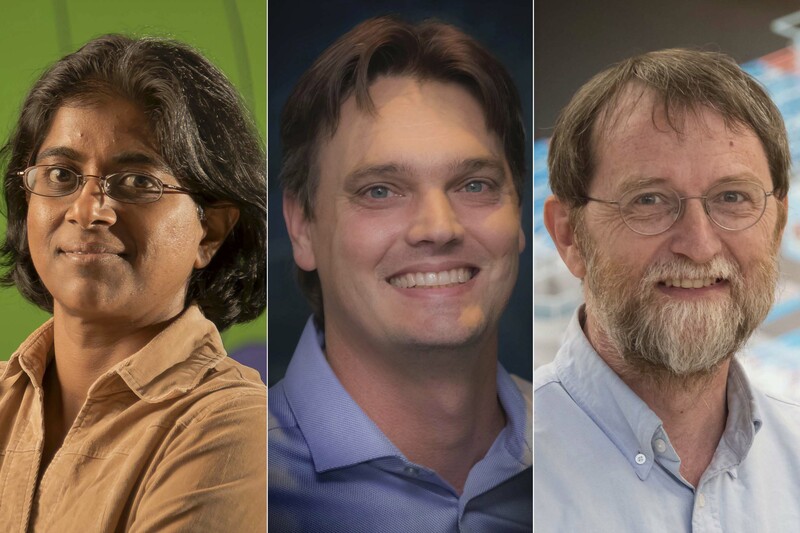 Senior scientists Radha Bahukutumbi, Group Leader for Integrated Modeling, Dustin Froula, Group Leader for Plasma and Ultrafast Physics, and Christian Stoeckl, a member of the Omega Experiments group, were each elected a Fellow of the American Physical Society (APS). Fellowship is a distinct honor for each of the recipients as it is conferred by their peers in recognition of outstanding scientific achievement. No more than one half of one percent of the APS membership is elected to Fellowship annually. Radha was recognized for "outstanding contributions to understanding physics of direct-drive implosions on OMEGA and NIF and for leadership in the National Inertial Confinement Fusion Program." Dustin was recognized for "the development and application of Thomson scattering to understand thermal transport and the onset of laser–plasma instabilities in indirect- and direct-drive fusion experiments." Christian was recognized for "scientific contributions and leadership in the development of novel optical, x-ray, and neutron diagnostics to advance the fields of inertial confinement fusion and high-energy–density physics." The University of Rochester is leading a seven-institution collaboration that promises to significantly broaden human understanding of "extreme matter"— matter that exists under pressures far higher than either on or inside Earth. The collaboration, with local principal investigators Profs. Pierre Gourdain, Gilbert "Rip" Collins, and Dustin Trail, includes Cornell, Michigan, Idaho State, Iowa, Princeton, and Stanford. The research team will develop an instrument called a high-amperage driver for extreme states, or HADES, which will allow scientists to produce and study extreme matter. The project is fully supported by the National Science Foundation, which awarded the University a $1.1 million grant in August. While extreme matter doesn't exist naturally on or inside Earth, it's quite common in the universe, especially in the deep interiors of planets and stars. Prof. Gourdain notes that HADES will lead to new knowledge about star formation and planetary collisions, the potential for life on other planets, and the properties of materials that make up deep-space objects. A rendering of HADES and further information can be seen here. More information about high-energy-density physics research at the University can be found here. Professor Robert L. McCrory, a physicist and scientific leader who has shepherded the University of Rochester's Laboratory for Laser Energetics to international prominence during the past 35 years, retired from Directorship on 1 October, the beginning of the federal government's fiscal year. McCrory, who holds the title of University Professor—one of just eight current or former members of the faculty to receive that distinction—and Vice President and Vice Provost, will step down from the University as of December 31. E. Michael Campbell, Deputy Director of LLE, will become Director of the Laboratory, pending approval of the University's Board of Trustees. UR President and CEO Joel Seligman said McCrory's record of scientific achievement represents an entrepreneurial and interdisciplinary approach that are the hallmarks of Rochester's approach to research and scholarship. The complete press release can be found here. LLE's Summer High School Research Program, now in its 29th year, involves students in many areas of investigation. The goal of this program, directed by Dr. Stephen Craxton, is to excite high school students about careers in the areas of science and technology by exposing them to research in a state-of-the-art environment. Shown above are four of the students with their projects. 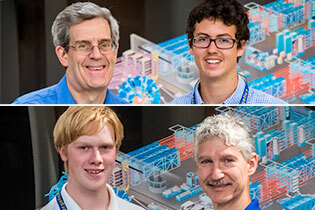 In the upper left is Ben Chaback (Byron Bergen High School), advised by Jim Knauer, with his Cherenkov-radiation neutron time-of-flight detector, which will measure neutrons on OMEGA experiments. In the upper right is Yujia Yang (Brighton High School), advised by Stephen Craxton, with one of her designs for future experiments on the National Ignition Facility. 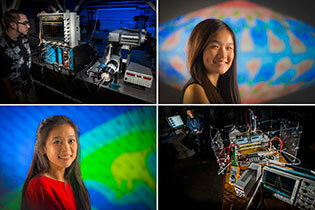 In the lower left is Claire Guo (Penfield High School), advised by Arijit Bose and Reuben Epstein, with a hydrodynamic simulation used to predict x-ray images. In the lower right and advised by Troy Walker and Greg Brent is Meshach Cornelius (Gates Chili High School) with a setup that monitors the deterioration of OMEGA flash lamps. More information about the Summer Research Program for High School Juniors can be found here. University of Rochester Graduate Student, Danae Polsin (left) and Lawrence Livermore National Laboratory Physicist, Amy Jenei, are shown here assembling AlkaliDiffEP targets containing sodium (Na) metal for x-ray diffraction experiments. The Na is sandwiched between single crystals of diamond (ablator) and lithium fluoride (window) in a dry argon atmosphere. The experiment will use the OMEGA EP Laser System to ramp compress the Na up to ~500 GPa. The powder-x-ray-diffraction image-plate (PXRDIP) diagnostic will be used to identify phase transitions and signatures of melting. The objective for these experiments is to obtain structural and electronic properties for an alkali metal at the highest pressures ever measured. This experiment will demonstrate a prototypical system to guide theory for examining ultra-dense matter beyond the Thomas–Fermi model. Equation-of-state (EOS), providing the pressure and internal energy as a function of the material density and temperature, is of fundamental importance for high-energy-density (HED) plasma science. Establishing a forum for examining the various EOS models and benchmarking them with existing/future experiments is especially important for understanding and designing inertial confinement fusion/HED experiments. 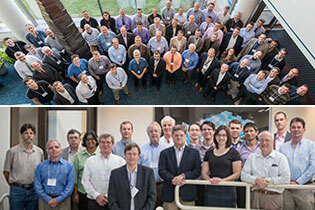 The first EOS Workshop was held at LLE 31 May–2 June, and represented 17 institutions and national laboratories. In support of LLE's 100-Gbar fill-tube project, University of Rochester students in the advanced mechanical design course ME 205 were tasked with creating a device for opening the top of a cryogenic shroud, allowing the shroud to retract without interfering with the encased target. This project was designated as the student's Capstone Project required for the completion of ME205. A Capstone Project is a multifaceted assignment that serves as a culminating academic and intellectual experience for students. Capstone projects are generally designed to encourage students to think critically, solve challenging problems, and develop skills such as oral communication, public speaking, research skills, media literacy, and teamwork. In most cases, the projects are also interdisciplinary, in the sense that they require students to apply skills or investigate issues across many different subject areas or domains of knowledge. With just one semester to complete this project, the students designed and built a working prototype (displayed in center) and then demonstrated that it met all of LLE's design requirements. 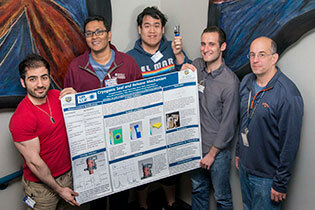 The students are, left to right, Brian Youssef, Devanjith Fonseka, Chayut Teeraratkul, and James Tobias, with their advisor, LLE Research Engineer, Jeff Ulreich. Their poster was displayed at the Hajim School of Engineering and Applied Sciences Design Day 2017. This year's Omega Laser Facility Users Group Workshop included posters by two participants from LLE's 2016 Summer High School Research Program. 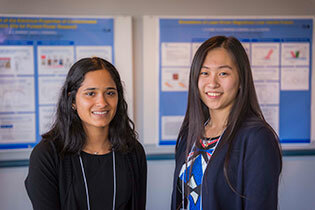 Advised by Ken Marshall, Sapna Ramesh (left) of Pittsford Mendon High School, presented a poster entitled "Characterization of the Electrical Properties of Contaminated Dielectric Oils for Pulsed Power Research." She will attend Columbia University. Leah Xiao (right) of Webster Schroeder High School, advised by program director Stephen Craxton, presented a poster entitled "Simulations of Laser-Driven Magnetized Liner Inertial Fusion." She will attend Yale University. A more-detailed description of their projects is available here. For over 17 years, the Commissariat à l'énergie atomique et aux énergies alternatives (French Alternative Energies and Atomic Energy Commission) (CEA) of France has conducted a variety of experiments at the Omega Facility. These experiments have ranged from diagnostic development (such as neutron-imaging systems) to studies of the hohlraum physics. For much of this time, the face of CEA at LLE has been that of Dr. Jean-Luc Bourgade—the most recent point of contact for CEA experiments. By Dr. Bourgade's estimate, he has spent nearly two years of cumulative time at LLE and has actively participated in many of the 698 target shots directed by CEA as well as hundreds of other target shots in which CEA was a collaborating institution. To mark this occasion, a reception was held at LLE on 7 June 2017, at which Prof. Robert McCrory presented Dr. Bourgade with a memento of his time in Rochester. Dr. Bourgade has a goal to return to Rochester to observe the April 8, 2024 total eclipse of the sun! The PJX-3 x-ray streak camera is used in a number of time-resolved spectroscopy experiments, including the OMEGA EP high-resolution spectrometer. Here, the linear dynamic range of the streak camera is being studied on the bench by Research Associate Steven Ivancic. The cryogenic targets used in OMEGA experiments require precise amounts of DT fuel with very smooth surfaces when frozen. To this end, three characterization stations are used to image the contents of the targets from two orthogonal directions. This is done to diagnose the state of the fuel and to characterize the ice layers formed during the laying process. Each characterization station consists of an optical table that is fitted with a moving cryostat docking station, a two-axis viewing system, and a high-quality, charge-coupled–device camera. The stations are capable of measuring the smoothness of the internal fuel layer to levels below 1 µm of surface roughness. Each characterization station is supported at an elevation that allows a moving cryostat transfer cart to be positioned under it. The moving cryostat can then be elevated into the docking station so that the target is visible to the viewing system. Shown here are Mark Wittman, Steve Verbridge, Desirée Whitaker, and Chad Fella. The fourth-harmonic (263-nm) probe diagnostic system provides the ability to study the plasma conditions for a variety of high-energy-density (HED) and basic physics studies. Located on the upper deck of the OMEGA EP Target Area Structure, the inset shows a wide-field view of the diagnostic's location along with Senior Laboratory Engineer Jay Brown accessing the diagnostic at the enclosure. The Ninth Omega Laser Facility Users Group (OLUG) Workshop, held 26–28 April 2017, attracted 110 researchers from around the world. The purpose of the workshop is to facilitate a continuing dialog among the individual users and between the users and LLE. Most of the 63 contributed posters were given by students and postdocs in attendance (inset). The tenth OLUG workshop will be held 25–27 April 2018. 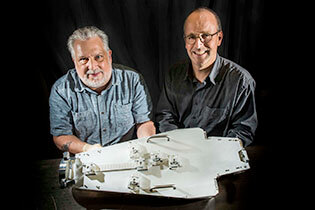 Shown with the diagnostic instrument manipulator (DIM) high-resolution spectrometer (dHiRES) are Senior Manufacturing Engineer, Tom Lewis, and Research Engineer, David Nelson. 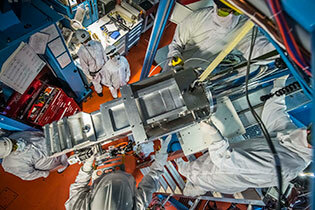 Designed and built at LLE, the dHIRES will be used at the National Ignition Facility (NIF). The dHIRES is a high-resolution crystal x-ray spectrometer snout for the DIM-based streak camera (DISC). It uses two conical crystals and one cylindrical crystal to measure both time-resolved and time-integrated Kr Heα and Heβ lines at stagnation to diagnose plasma conditions. The electron temperature, Te, and density, ne, will be measured by doping a surrogate capsule ("SymCap") with a small amount of krypton gas. 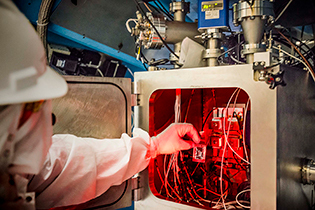 The Princeton Plasma Physics Laboratory was responsible for crystal design and will carry out the crystal testing, alignment, and instrument calibration. LLE has designed a novel Target Area System for the Dynamic Compression Sector (DCS) at the Advanced Photon Source (APS) located at Argonne National Laboratory near Chicago. The system includes a target chamber, target positioner, and optical train to deliver the DCS laser. In addition to the port used to deliver the laser beam, the target chamber includes 15 large ports for target diagnostics and auxiliary systems and smaller ports for the Target Viewing System. The target chamber translates horizontally and vertically to align the target with various APS x-ray beam positions. The chamber also rotates through 135° to change the laser angle of incidence with respect to the x-ray beam; this supports a range of different experimental configurations. The laser beam path in the target area is an extension of the laser clean-room envelope. Delivery of the DCS Target Area System will take place in April 2017 at which time the DCS will be available to national and international scientific users. Dale Guy (left) and Robert Earley (right) are shown working on the system. The finished system is shown in the inset. Additional information about the DCS can be found here. The Omega Laser Facility is housed in three, interconnected buildings roughly the size of two football fields. However, because of the intricate nature of transporting high-power laser beams, the environment within these buildings requires extremely stringent air-quality standards, effectively making these buildings very large clean rooms. In order to maintain a low-particulate environment, a specialized workforce, detailed procedures, and specialized equipment are required. 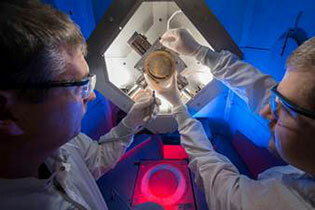 Contamination control measures are essential to protect the ~4500 lenses, mirrors, and other optics of OMEGA. Any particulate on a glass surface may absorb, refract, or reflect light and can lead to reduced transmission, local overheating that can cause substrate or coating damage, and beam-intensity modulations. Although the Laser and Target Bays in the Omega Facility are rated class 1000, they are treated as class 100 to reduce long-term contamination. From the LLE viewing galleries, one can frequently see personnel in full suits, such as in the image above of Laboratory Technician Muhsin Umsu ("Moose"). All personnel accessing these technical areas receive training on contamination control procedures. Located near the shield wall underneath the OMEGA viewing gallery in the Target Bay, the ultraviolet alignment table (UVAT) is used daily for several beam alignment and measurement missions. These tasks include targeting operations, ultraviolet centering checks, focus lens assembly retro checks, beam-interference checks, harmonic-energy-diagnostic alignment checks, F-alignment sensor package alignment, ultraviolet diagnostic table alignment, optical transport instrumentation system measurements, and 2ω and 4ω targeting. The UVAT uses two alignment laser sources to accomplish beam alignment and measurement missions: a 1.5-W UV laser operating at 351 nm and a 500-mW green laser operating at 527 nm. The UV laser is capable of producing two full-aperture (~270-mm-diam) beams; one beam exits the table traveling south and the other north. The green laser is capable of producing one full-aperture beam traveling north only. 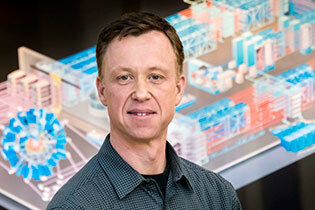 Shown at the UVAT's laser-protective barriers is Senior Manufacturing Engineer, Ray Huff. Shown is a photo from 2003 of LLE senior scientist Reuben Epstein and his then high school student Wen-fai Fong. After graduating from Pittsford Sutherland High School, Wen-fai double majored in physics and biology at MIT and then moved to Harvard for her Ph.D., where she established a mentoring program for graduate students. Wen-fai's Ph.D. thesis was recently named the 2016 Outstanding Doctoral Thesis in Astrophysics by the American Physical Society. She is currently at the University of Arizona's Steward Observatory on an Einstein Postdoctoral Fellowship. Following the award, she wrote her advisor, "I truly appreciate the time you spent with me early on in my career. I think my early experiences in physics and astronomy with kind and patient mentors such as yourself were crucial in solidifying my career aspirations to continue in this field permanently. . . . it was really a very formative summer for me. You are changing lives through the program!" Applications for the 2017 Summer High School Program are now available. 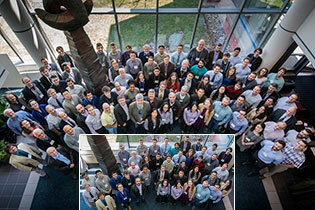 Shown are the attendees of the first Laser–Plasma Interaction (LPI) Workshop. The purpose of this Workshop was to develop a strategy and recommended actions for laser–plasma interaction research and development relevant to National Nuclear Security Administration (NNSA) missions. A goal of this workshop is to arrive at a shared common view of the desired future state of LPI research. The organizers will use the material shared at this workshop to write a strategy document with a target audience of the NNSA and senior national laboratory leadership. The OMEGA and OMEGA EP Laser Systems require continued maintenance to ensure high availability and effectiveness. Liquid-cooled laser amplifiers enable the high shot rate at Omega and particular attention is required to maintain performance. 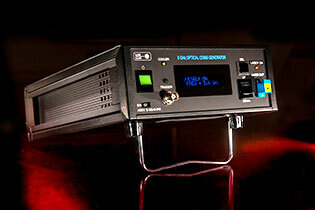 To minimize on shot failures, the amplifiers are inspected regularly and damaged or degraded flash lamps are replaced. It is important to ensure flash lamps are free of contaminants. Contaminants can etch the glass of the water jackets and may transfer to the blast windows when the flash lamps fire. 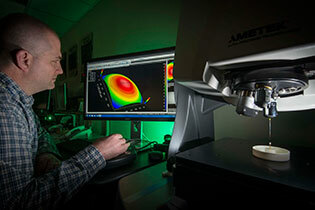 Laboratory Engineer, Michael Scipione, is shown examining a brick of flash lamps. Webster Kehoe and Nate Morse were named 2017 Scholars in the Regeneron Science Talent Search, this country's most-prestigious science competition for high school seniors. Kehoe, shown above right with advisor and program director Stephen Craxton, is a student at Joseph C. Wilson Magnet High School. Morse, shown below left with advisor Mark Guardalben, is a student at Allendale Columbia School. Only 300 students are selected as scholars (previously identified as semifinalists) from over 1,700 entrants and will receive $2,000, with an additional $2,000 to their school. Forty of the scholars will be named as finalists on 24 January and will receive an all-expenses paid trip to Washington, DC for the final judging from 9–15 March to compete for the top prize of $250,000. Since its inception in 1989, LLE's Summer High School Research Program has produced 34 scholars, including 4 finalists. LLE's program has had 353 participants, 127 of whom have received degrees beyond their undergraduate work. Application forms for the 2017 program will be available in early February on the LLE web site. A nuclear interaction vessel (NIV) was designed and fabricated for OMEGA nuclear reactions experiments. It is positioned 9 cm from the center of the OMEGA target chamber and is constructed of thin-wall (1‑mm) aluminum to minimize additional neutron-scattering signals. The NIV is attached to a specially designed bracket mounted in one of the ten-inch manipulator (TIM) diagnostic ports on the OMEGA target chamber. The NIV was filled with either deuterated or non-deuterated compounds for the initial experiments on OMEGA to study the deuterium break-up reaction. Future experiments will use other low-Z compounds to investigate additional break-up reactions that are of interest to the nuclear physics community. Shown is Research Associate, Chad Forrest, who is configuring the NIV for target physics shots on OMEGA. The primary support for the NIV came from Experimental Support Group Leader Chuck Sorce and Senior Manufacturing Engineeer John Szczepanski. The LLE Summer Research Program for High School Juniors completed its 28th year ending with presentations by its 13 students. The goal of this program, directed by Dr. Stephen Craxton, is to excite high school students about careers in the areas of science and technology by exposing them to research in a state-of-the-art environment. Shown above are four of the students with their projects. In the upper left is Nate Morse (Allendale Columbia School), advised by Mark Guardalben, who studied frequency-conversion crystal design and is seen within the OMEGA EP Target Area Structure near the crystals. In the upper right, Sapna Ramesh (Pittsford Mendon High School), advised by Ken Marshall, is shown pipetting an oil sample to measure its electrical properties as part of her pulsed-power research project. In the lower left is Joy Zhang (Penfield High School), advised by Roger Janezic, adjusting a digital microscope that is being developed for use on the target Fill/Transfer Station to view target defects. In the lower right and advised by Stephen Craxton is Leah Xiao (Webster Schroeder High School) with one of her simulations of laser-driven, magnetized liner inertial fusion. More information about the Summer Research Program for High School Juniors can be found here. 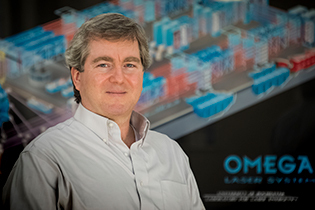 Senior Scientist Jake Bromage, Group Leader for Laser Technology Development, was chosen as Senior Member by the Board of Directors of The Optical Society of America (OSA). This distinction provides well-established individuals recognition for their experience and professional accomplishments within the field of optics and photonics. Celebrating its 100th anniversary, the Optical Society is the leading professional home to 270,000 accomplished scientists, engineers, students, and entrepreneurs. Hong Sio (MIT grad student) is shown holding the new 3-cm x-ray and charged-particle nose cone for the particle temporal diagnostic (PTD). It is a joint project between LLE and MIT, designed to simultaneously measure DD-n and D3He-p reaction histories in inertial confinement fusion implosions with high relative precision. The PTD team includes Mark Bedzyk (design and engineering), Joe Katz (assembly and testing), Hong Sio and Christian Stoeckl (design), Dave Weiner (optical engineering), Michelle McCluskey (project manager), and the MIT central machine shop (manufacturing). Laser-fusion experiments employ cryogenically cooled targets that each contain a shell of solid hydrogenic fuel. The interior surface of the hydrogenic fuel (referred to as a "layer") is required to be very smooth to prevent perturbations from magnifying and spoiling target performance. Layering spheres are used to create these precisely layered cryogenic targets. They rely on a uniform layering-sphere temperature and beta heating from tritium decay within the shell to create spherical isotherms around the target. The new layering sphere (shown above) has the design features that are needed to fill the target with D2 (and DT) through a 10-µm-diam tube. This layering-sphere assembly required three months of thermal analysis to design and was manufactured in-house within a three-week period. The performance of the new design is being tested in the Cryogenic Fill-Tube Test Facility in the Target Fabrication area. The immediate goal of these experiments is to control the thickness of a deuterium fuel-layer in the capsule to within ±1 µm of the desired value. Future experiments with DT (planned for 3QFY17) will determine if the design is adequate to form a uniformly thick ice layer. 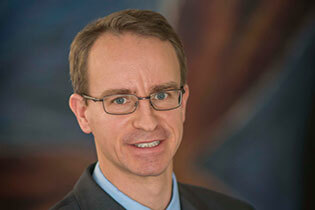 Jason Myatt has been selected to serve as Topical Associate Editor for Physics of Plasmas. As Editor-in-Chief Professor Mike Mauel said in his announcement, "Jason is a leading expert on laser–plasma interactions." He will serve the community well. Synchronizing the arrival times of OMEGA's 60 beams on target has been improved to <5-ps rms by placing a scattering sphere at target chamber center. 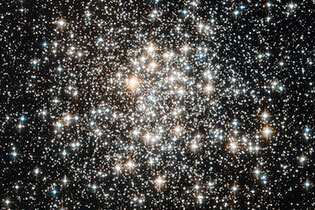 When illuminated with a directional beam of blue light, the 1-mm sphere scatters uniformly into 4π steradians, and the scattered light is used to co-time each beam. Personnel developing this technique include Bill Donaldson and Joe Katz. The National Academy of Sciences Committee on Opportunities in the Science, Applications, and Technology of Ultrafast Lasers met at LLE. Presentations included an overview of LLE's mission, capabilities, partnership culture, and users facility. Specifics on LLE's ultrahigh-intensity science and laser technology were also provided. Research Engineer Kenneth L. Marshall, a member of the Optical Materials Technology group, was elected a Senior Member by the Board of Directors of SPIE, the International Society for Optics and Photonics. SPIE Senior Members are members of distinction who are honored for their professional experience, their active involvement with the optics community and SPIE, and significant performance that sets them apart from their peers. Originally founded as the Society of Photographic Instrumentation, SPIE has more than 264,000 constituents from approximately 166 countries. The National Nuclear Security Agency and the French Commissariat à l'énergie atomique (CEA), along with investigators from the Lawrence Livermore National Laboratory, the Sandia National Laboratory, and the Massachusetts Institute of Technology, held a two-day workshop at LLE. The diagnostic status of the large facilities were discussed, including x-ray imaging, detectors, and spectroscopy; optical and nuclear diagnostics; and streak-camera development. The inset shows the contingent of French researchers from CEA. 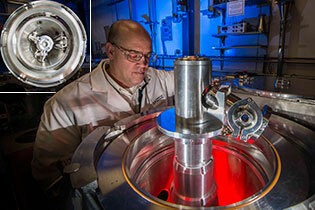 Shown is the rotating cart (RCART) redesigned and built at LLE to be used at the National Ignition Facility (NIF). 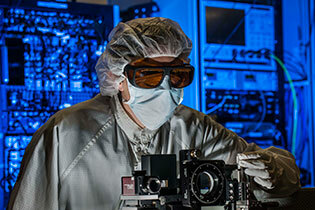 Scientists at the NIF must orient many diagnostics at either 0° or 90°. Currently, the diagnostic (including cart and air box) is removed from the back of a diagnostic instrument manipulator (DIM, seen in the insert) and then the cart is reconfigured in a contamination-controlled area. This is a one-day process. The RCART will facilitate the transition from 0° or 90° without removing the cart from the DIM and will lower the transition time to less than one hour. The RCART team includes Mark Bedzyk (design and engineering), Tim Clark (manufacturing), Chad Abbott (assembly), Maryum Ahmed (NIF system engineering), Todd Smith (test and measurement), and the LLE Model Shop (manufacturing). The insert provides scaling for the DIM and the RCART. Dr. Michael Rosenberg, a new staff member at LLE, has been selected to receive the prestigious Marshall Rosenbluth Award for Outstanding Doctoral Thesis given by the American Physical Society (APS) Division of Plasma Physics (DPP). The award citation states "for first experimental demonstration of the importance of kinetic and multi-ion effects on fusion rates in a wide class of inertial confinement fusion implosions, and for use of proton diagnostics to unveil new features of magnetic reconnection in laser-generated plasmas." 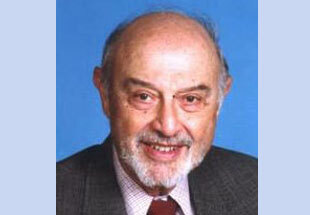 Rosenberg will receive the award at the APS DPP meeting in November. There are many aspects to Rosenberg's thesis, but the most important and influential accomplishment was to discover, quantify, and document the existence and importance of kinetic and multi-ion effects in inertial confinement fusion plasmas and to clearly delineate the transition from the kinetic to the average-ion fluid description. 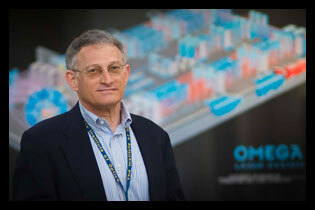 His research was done at the Omega Laser Facility and the National Ignition Facility and leveraged techniques and instruments developed at the MIT High-Energy-Density Accelerator Facility. Rosenberg is presently at Lawrence Livermore National Laboratory (LLNL), working with both LLE and LLNL colleagues on the Megajoule Direct-Drive Campaign (part of the national direct-drive program). Their goal is to understand laser–plasma interaction physics in the large hot plasma corona of ignition direct-drive targets. After nearly 20 years of reliable service, the linear motor used to remove the shroud on cryogenic target shots is being replaced and installation is scheduled for December. The new design, led by Mechanical Engineer Cody-Shane Taylor, benefits from operational experience gained with the original motor design. It incorporates new features, including: dual position sensors to mitigate control faults during high-yield shots, an integrated load-cell for precision force sensing, a high-precision modular design that can be readily serviced in situ, personnel safety features, and use of commercial off-the-shelf motor and linear bearing hardware. The Cryogenic Target Handling System team (left to right) consists of Jeff Ulreich, Chad Abbott, Mike Bradley, Jeff Kunzel, CodyShane Taylor, Dave Lonobile, Doug Jacobs-Perkins, Brian Rice, and Milt Shoup. With the OMEGA target structure in the background, Senior Laboratory Engineer Jay Brown is shown finalizing the setup of the 3ω UV spectrometer (UVSPEC) calibration source. 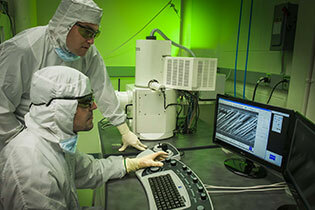 This source generates and transports a precision 351-nm wavelength to the UVSPEC diagnostic for accurate calibration. Located on the fiducial table, this 3ω calibration source frequency triples the existing infrared fiducial laser to the UV and launches it into optical fiber for transport to the UVSPEC. The components of the source can be seen in the inset. As part of the Certificate in Nanoengineering Program, OPT 254 is a required undergraduate laboratory and is offered through the University's Institute of Optics in three modules: scanning electron microscopy, atomic force microscopy (AFM), and confocal microscopy. 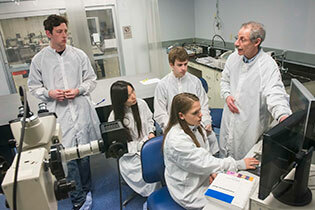 LLE Scientist, Semyon Papernov, shown here with four of his eight students, teaches the AFM module in two sections. In addition to lectures on the nature of forces working at the nanoscale and on principles of atomic force microscopy, students receive hands-on experience in using AFM. Also, discussions on various types of AFM image processing resulting in rich topographical sample information take place. Here, Dr. Papernov discusses the geometry of craters generated in coatings by laser radiation. The Digital Instruments Nanoscope III atomic force microscope, visible at the lower left, was used to take the images that they are discussing. The Eighth Omega Laser Facility Users Group (OLUG) Workshop, held 27–29 April 2016, attracted 112 researchers from around the world. The purpose of the workshop is to facilitate a continuing dialog among the individual users and between the users and LLE. Most of the 76 contributed posters were given by students and postdocs in attendance (inset). The next OLUG workshop will be held 26–28 April 2017. 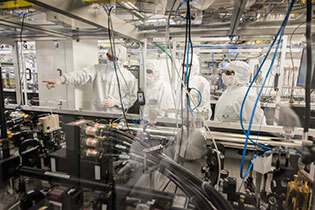 Research Associate Steven Ivancic is shown at the target chamber securing the extreme ultraviolet (EUV) spectrometer to the Multi-Terawatt (MTW) laser target chamber. Its nose cone can be seen inside the target chamber. 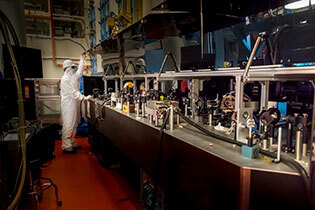 The EUV spectrometer measures emission from targets rapidly heated by the subpicosecond MTW pulse. 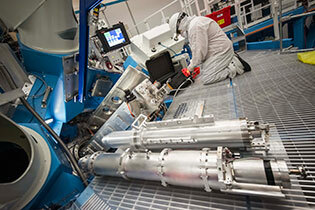 This is part of the activation of the EUV Spectrometer project and the second-harmonic–generation project on the MTW. This spectrometer was funded by a Department of Energy Office of Fusion Energy Sciences grant to study the energy flow in solid-density materials. This 2-mm-diam "anti-target" was shot in the thru-tank calorimetry campaign in January 2016. The target consisted of a copper disk with a 2-mm aperture to allow focused UV beams pass through the "anti-target" to the calorimeters mounted on the opposite ports of the target chamber. The large plastic shield attached to the copper disk was originally aluminum-coated to be opaque and block any unfocused residual red and green light from reaching the opposite port. The NexView 3D Optical Surface Profiler is Zygo's flagship white-light interferometric microscope that can resolve subnanometer topography. LLE's configuration will make it possible to measure nearly a complete range of fields of view from 40 × 40 µm to 13,700 x 13,700 µm, including stitching capabilities for larger areas. 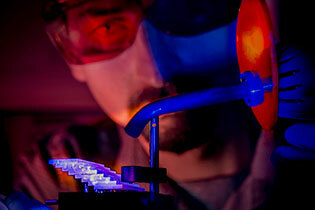 Optical Manufacturing Engineer, Brian Charles, is shown measuring a glass surrogate target for OMEGA EP. The instrument has been utilized for measurements on circular and linear gratings, target step-height measurements, 20-µm periodic structures that are about 2 µm in height, and characterizing the profiles of glancing angle deposition (GLAD) coatings. One scan in particular provided evidence of a 10-nm-high by 3‑mm-diam phase gradient in the center of a UV lens undetectable by vendors. Mechanical Engineer, Frank Ehrne, is shown qualifying the dimensions on the piezo crystal stage assembly of the HiResSpec, a high-resolving-power x-ray spectrometer for OMEGA EP. The instrument is designed to achieve several thousand resolving power and ~2‑ps temporal resolution. The project supports diagnostic development activities considered transformational by the National Diagnostic Plan. Applications include high-pressure materials research, radiation transport, opacity, and applications of ignition. Optical Manufacturing Process Engineer, John Spaulding, and Coating Operator, Justin Foster, are shown installing an optic on a new prototype stage built to support research and development work on glancing angle deposition (GLAD) coatings. The deposition system is designed to allow for growth of an oriented, birefringent film structure in stripes across an optical surface, and the resulting film thickness is controlled such that each stripe region is a quarter-wave plate. This custom stage, designed and built by Angstrom Engineering, has movements for x and y translation, tilt, and rotation that make it possible to manipulate the part during deposition in order to control the resulting film structure, and the stage will be able to coat up to a 100-mm-diam optic. GLAD coating research supports the potential manufacture of a distributed polarization rotator (DPR) component that would be integral to beam-smoothing efforts for direct-drive or polar-direct-drive campaigns at the National Ignition Facility. Research scientists Marius Adrien Millot (LLNL) and Stephanie Brygoo (CEA) are shown displaying a Science Magazine news article on their research at LLE. They used the OMEGA Laser System to demonstrate possible helium "rain" on Saturn to account for the unexpectedly high brightness for a normally cooling planet. The helium "rain," occurring at pressures and temperatures that can be created using OMEGA, unleashes gravitational potential energy that makes Saturn more luminous. 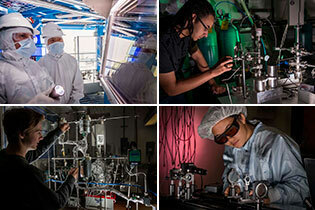 In addition to LLNL and CEA, scientists come from around the world to take advantage of the facilities at LLE. The Science Magazine online article is available here. Optical Manufacturing metrology technician, Hope D'Alessandro, is seen evaluating the wavefront performance of a large laser component. The optical testing is accomplished using a Zygo 18-in. aperture interferometer. The software displays the surface topography of the tested sample with colored maps, which illustrate the imperfections from a flat surface. This interferometric test is an essential step to validate the reflected wavefront specification of coated optics destined for laser systems such as OMEGA, OMEGA EP, the NIF, and at CEA. The application of a thin-film coating has the potential to significantly change the surface flatness of a finished part, and documenting that final coated result is important to both qualify the component for use on the laser system as well as to help us understand and quantify the impact of the coating process. 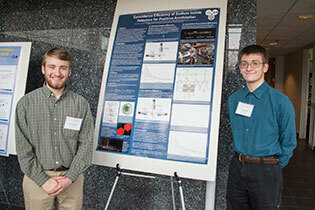 A poster presented by Thomas Eckert and August Gula, undergraduate physics students at Houghton College (shown here at the Omega Laser Facility Users Group 2015 Workshop) was named the outstanding presentation in the Education and Outreach: Undergraduate/High School Research session at the 57th Annual Meeting of the APS Division of Plasma Physics. The poster discussed recent Monte Carlo simulations to understand the sensitivity of the detectors used in the neutron final-state measurements. The simulations were used to establish the absolute value of the 12C(n,2n)11C cross section for incident neutron energies from 20 to 25 MeV. This nuclear reaction has a neutron-energy threshold of approximately 19 MeV and is being considered for use as an activation diagnostic in inertial confinement fusion (ICF) implosions on OMEGA and at the National Ignition Facility. Emily Sekera (B.S. Chemistry, RIT 2015) and Ken Marshall (Acting Group Leader, Optical Materials Technology) are shown in front of a computationally generated molecular model of an azobenzene photoswitchable alignment material being investigated for use in an optically addressable liquid crystal (LC) beam shaper. Photoisomerization of the azobenzene pendants on the alignment coating redirects the orientation of the LC material and switches the device between two optical transmission states without compromising its near-IR laser-damage threshold. Computational chemistry modeling, based on density functional theory, is being employed to study the impact of molecular structure on optical-switching properties in photoswitchable-alignment materials. Test materials include methacrylate and acrylamide polymer backbones, which have been functionalized with azobenzene and spiropyran pendants. U.S. Senator Kirsten Gillibrand recently visited LLE. She is an advocate for continued federal resources for the Lab, saying that LLE plays a vital role in national security and local economic growth. "Each of those scientists that's coming here to test something is doing cutting edge research, breaking barriers, and finding solutions to the myriad of problems our scientists and companies try to solve," says Gillibrand. 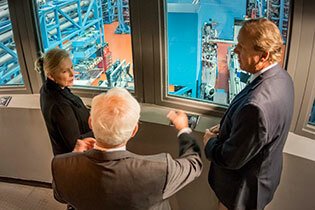 Here, Senator Gillibrand is shown getting a tour of the OMEGA Laser System by Senior Scientist John Soures and Omega Laser Facility Director Sam Morse during her visit to LLE. Through funding from Washington State University, LLE is constructing the Dynamic Compression Sector (DCS) laser, which will ultimately be housed in the Advanced Photon Source at Argonne National Laboratory. The DCS laser will be a 100-J tool for shock-physics experiments to be carried out at a first-of-a-kind user facility dedicated to dynamic compression science. Brilliant colors illustrate the complex interaction between the diffractive and refractive axicons that constitute a Graxicon, a unique optic developed by the Optics and Imaging Sciences group. The Graxicon can be designed to provide rapid focal-spot zooming to increase laser coupling to fusion targets or to provide a rapidly changing ring beam for a variety of laser applications. Alison Christopherson is a Ph.D. candidate in the University's Department of Mechanical Engineering studying under Prof. Riccardo Betti. Last month, Alison's presentation at the Inertial Fusion Sciences and Applications conference was selected as the outstanding talk by a student. This was wonderful news for Alison, the Laboratory, and the University, and is a credit to both her and her advisor. In addition, Alison will be giving an invited talk on her research at the American Physical Society Division of Plasma Physics conference next month in Savannah, GA. Her research is aimed at measuring the heating by alpha particles in inertial fusion implosions. Alison's work on alpha heating has recently appeared in a paper published in Physical Review Letters. The LLE Summer Research Program for High School Juniors just completed its 27th year. Shown in this composite are four of the twelve students with their projects. In the upper left is Ryan Gao (Brighton High School) (right) with his advisor Matthew Barczys (left), who studied how damage to the final OMEGA EP UV mirror can influence the laser pulse. In the upper right is Gabriel Evans (McQuaid), advised by Walter Shmayda, who measured the hydrogen pressure over palladium hydride. In the lower left is Alex Proschel (Pittsford Sutherland), also advised by Walter Shmayda, whose topic was "Isotopic Exchange over Platinized Molecular Sieve." In the lower right is Eileen Norris (Brighton), advised by Seung-Whan Bahk, who designed an imaging telescope. More information about the Summer Research Program for High School Juniors can be found here. Target Fabrication Technician, Michelle Evans, is shown performing target metrology, in this case one of the magnetic-field plasma targets, using LLE's Powell scope. Evans uses the Powell scope to confirm target mounting angles (matching them with the PI's VisRad models) and to capture images of the targets in various chamber views. In addition, the necessary alignment measurements required for operational tasks will be documented and used on shot day by the experimental watchstanders. The multiple-pulse driver line (MPD) provides on-shot co-propagation of two separate pulse shapes in all 60 OMEGA beams. MPD allows for dynamic bandwidth reduction. Smoothing by spectral dispersion (SSD) bandwidth is applied to the picket pulse shape generated by the SSD driver. No bandwidth is applied to the pulse generated by the Phoenix (PHX) driver. Shown aligning a diagnostic upgrade supporting MPD are Laboratory Engineer, Jeremy Zenkar (left), and OMEGA System Scientist, Tanya Kosc (right). 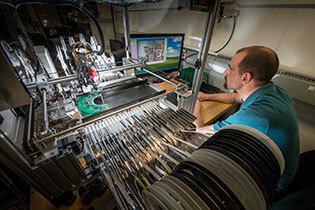 Senior manufacturing engineer Joe Romano is shown using an automated Manncorp 7722FV pick-and-place machine to assemble printed circuit boards (PCB's) for the solid-state Pockels-cell driver. In 15 minutes, this machine can assemble a circuit board that would normally take someone an entire eight-hour shift to assemble by hand-soldering the components. One hundred twenty PCB's are being built using this machine for this portion of the project. Ph.D. candidate Sivan Salzman is shown nulling fringes on the white-light interferometer's NewView 100 live-image screen. She is measuring the surface texture of a polycrystalline, chemical-vapor–deposited (CVD) zinc sulfide (ZnS) that was polished with an advanced acidic magnetorheological finishing (MRF) fluid developed at LLE. A 5× Michelson objective was used to provide 1.0-mm × 1.4-mm false-color 2-D and 3-D maps, along with a black and white image of the measured surface. CVD ZnS is an important material for producing infrared windows and domes. MRF polishing of such material, where a magnetic material stiffens a fluid suspension in contact with a workpiece, opens the opportunity to produce complex and aerodynamic shapes. The acidic MR fluid is composed of zirconia-coated carbonyl-iron particles, a procedure invented by Professor Stephen Jacobs and his Materials Group at LLE during 2007–2008 and patented in 2014. The Lawrence Livermore National Laboratory (LLNL) National Ignition Facility (NIF) soft x-ray imager (S600-D) is shown being dimensionally checked for conformance to LLE manufacturing prints utilizing the "Helmel Checkmaster" coordinate measuring machine located in the Quality Control lab. Displayed on the screen are real-time measurements of the part under test. Components are often designed and fabricated to tight tolerances to ensure equipment performance and must be dimensionally verified prior to assembly and use. The LLE Mechanical Engineering (ME) group provides a wide spectrum of services in the production of high-quality scientific equipment, including overall design, fabrication, inspection and quality control, as well as final assembly and system integration. 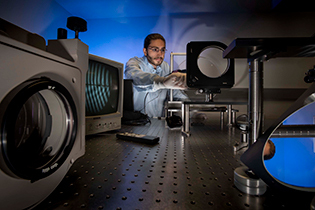 The ME group supports scientists from LLE and LLNL in the design and fabrication of diagnostics and equipment used on the OMEGA, OMEGA EP, and NIF Laser Systems. Undergraduate Research Assistant Jeremy Hassett is shown with a software application he wrote to aid engineers and scientists at LLE with diffraction-grating system design and analysis. The software application is capable of calculating the diffracted efficiencies for plane-reflectance gratings, such as the one shown inside the spectrometer on the right. The core of the software is a sophisticated numerical algorithm for calculating theoretical diffraction efficiencies based on the groove shape, wavelength of light, incident angle, and many other parameters. The overall goal of the project is to allow engineers and scientists to accurately characterize the diffracted efficiencies of gratings in similar setups to those used throughout the laboratory. While a student at the University, Jeremy presented two award-winning posters—one at an undergraduate symposium and the other at the Omega Laser Facility Users Group workshop. The software that he designed is available for download here. Absolute equation-of-state (EOS) measurements of porous, hydrocarbon-based foams have been carried out on the OMEGA EP Laser System. The experiment uses a target composed of a plastic ablator, a metal pusher, and a resorcinol formaldehyde foam located inside a plastic tube. The target is driven by a high-energy laser pulse, driving a shock wave into the foam and compressing it. By measuring the pusher and shock velocities inside the foam, absolute EOS data can be obtained. A backlighter target using a metal foil is energized by a second set of laser beams, creating an x-ray source for imaging the foam dynamics. Essential to this measurement is the PJX imager (PJXI), which employs a high-speed x-ray streak camera (PJX) coupled with a monochromatic, slit x-ray imager nose cone. Research Engineer Chad Mileham is shown mounting the imaging nose cone to the PJX streak camera prior to the experiments. With many new variations of planar cryo targets being developed, a new method to view target designs off-line has been advanced. The new in-cart viewing system allows for studies of durability, new fill methods, and new target manufacturing studies off-line. The system makes it possible to record and view the planar target ice transitions without having to use the center of the target chamber. This allows for new target designs and new manufacturing processes to be tested in a cart prior to deployment on OMEGA. The cameras can provide color video or still pictures of ice or bubble formation during phase transition of the fuel. Bob Earley, Research Engineer and Principal Investigator for this project, is shown with the camera housing above the shroud, while a view from above showing the camera inside the shroud is seen inside the inset. Dr. Stephen Jacobs passed away peacefully on May 30, 2015. Dr. Jacobs joined LLE in 1975 as a Postdoctoral Fellow in the Laser Development Group and remained at LLE for his entire career. After serving as a Research Associate at LLE in 1976, he was appointed to the position of Scientist at LLE in 1977, Group Leader for Optical Materials in 1980, and Senior Scientist in 1982. 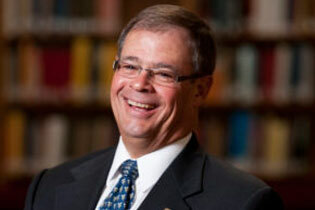 Dr. Jacobs also served as the Acting Director of LLE's Engineering Division from 1984–1990, Optical Engineering Department Head from 1990–2007, and was most recently serving as the Optical Materials Technology Department Head. He was appointed as a full Professor in both the Institute of Optics and the Department of Chemical Engineering (2000), as well as in Materials Science (2001). Dr. Jacobs authored over 30 peer-reviewed publications, two book chapters, and holds 17 patents covering a wide range of optical materials and devices. Dr. Jacobs was highly passionate about ensuring that young minds are exposed to, excited by, and motivated toward careers in science and technology. He has served as thesis adviser for many students in Optics, Materials Science, and Chemical Engineering, and served as the Outreach Education Chair for the Optical Society of America Rochester, NY Section for over 15 years. The Seventh Omega Laser Facility Users Group Workshop, held 22–24 April 2015, attracted 110 researchers from around the world. The purpose of the workshop is to facilitate a continuing dialog among the individual users and between the users and LLE. Most of the 70 contributed posters were given by students and postdocs in attendance. The next workshop will be held 27–29 April 2016. 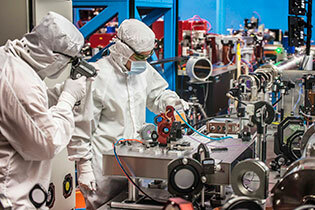 Optical and mechanical engineers at LLE designed the National Ignition Facility (NIF) soft-x-ray imager S600-D in collaboration with scientists and engineers at Lawrence Livermore National Laboratory. The S600-D snout uses a single grazing incidence reflection, soft x-ray filters, and a slit aperture to form a 4× magnified, one-dimensional image of target in the 100- to 500-eV photon energy range on the entrance slit of an x-ray streak camera. A dual-channel version of the snout is available for 1-mm soft-x-ray sources, and a single-channel version is available for 3-mm sources. 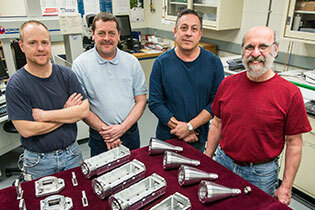 The fixed and modular mechanical design of the S600-D snout relies on the high-precision fabrication of the mechanical components provided by the LLE machinists Scott Gross, Bob McAllister, Steve Lombardo, and Ron Callari, who are shown in the photograph above along with the parts for four of the six snouts that will be delivered to the NIF. 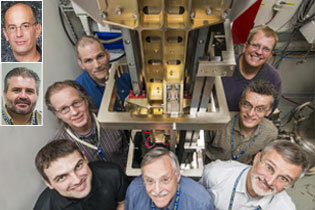 A performance qualification shot of the S600-D will be performed on the NIF early this summer. Albert Simon, who recently celebrated his 90th birthday, has contributed much to the University of Rochester over the years—as a professor and chair of mechanical engineering and as a senior scientist at the Laboratory for Laser Energetics. His research in plasma physics has advanced our understanding of direct-drive laser fusion; he has inspired many graduate students to follow in his footsteps. So it was gratifying indeed when his family celebrated his 90th birthday with a donation to LLE that will be used to support its high school summer program. It is a fitting way to honor Al's many contributions. Read more . . .
Highlighted as the CryoNTD in a previous Quick Shot (01/19/15), the P11-NTD is a next-generation neutron temporal diagnostic, which measures the neutron production history during high-yield cryogenic implosions. The diagnostic utilizes a ~16-m image relay in order to shield the ROSS streak camera recording device (shown in red) from stray neutrons. The streak camera records the light produced from a neutron-sensitive scintillator placed 10 cm from the center of the target chamber as well as from two optical timing fiducials. 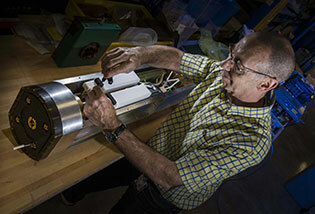 Senior Laboratory Engineer and P11-NTD instrument specialist, Joe Katz, is shown checking the final alignment of the diagnostic before its first shot. The measured neutron width of 80±10 ps was in very good agreement with theoretical predictions. 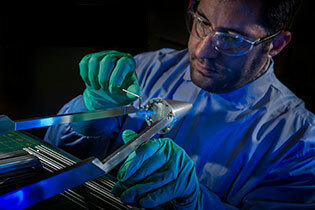 Roger Gram, a Research Engineer at LLE, is shown adjusting the position of a temperature sensor that is attached to a NIF-size cryogenic target. The inset shows the target assembly in more detail: the 3-mm-diam target, while supported and filled through a stainless-steel tube, is thermally attached to a copper foil that contains a heater and temperature sensor. The size and mass of the components are kept to a minimum, allowing the heat that is released when liquid deuterium freezes to be measured. This experimental platform is being used to evaluate methods to seed the growth of a deuterium crystal from the condensed liquid while preventing the liquid from supercooling. The goal is to optimize the process used to form a single-crystal defect-free ice layer inside a target. The next generation Kirkpatrick–Baez (KB) microscope employs new x-ray optics for use on OMEGA cryogenic target implosions. Developed by Senior Scientist Frederic J. Marshall, the 16-image KB optic fits onto an existing OMEGA KB microscope chassis. The optics (seen in the right side of the image) have been arranged so that the individual images fall onto the imaging elements of a fast framing camera. The framing camera is used to time-gate the images from each optic to produce a "movie" of the late stages of a cryogenic implosion with a frame-to-frame resolution of 30 ps. The compact mirrors have a demonstrated spatial resolution of ~5 µm. This unique combination of spatial and temporal resolution is an important addition to the diagnostic arsenal at LLE. The measurements from this new KB microscope will be used to infer the central pressure achieved in the cryogenic implosions, a key performance metric in establishing DT fusion ignition equivalence with the OMEGA laser. Over the past decade, scientists at MIT and LLE have developed a number of magnet-based, charged-particle spectrometers for the OMEGA laser. These spectrometers have contributed significantly to the fusion mission of the Laboratory and have been used for precise measurement of neutron-scattering cross sections (this work was published a few years ago in Physical Review Letters by J. Frenje et al.). A new diagnostic was recently developed to meet measurement requirements for experiments on the National Ignition Facility (NIF). The magnet-based particle time-of-flight (MagPTOF) diagnostic will measure the shock and compression bang times on a variety of implosion platforms. Hong Sio, an MIT graduate student, is planning to use data from this instrument for his Ph.D thesis. 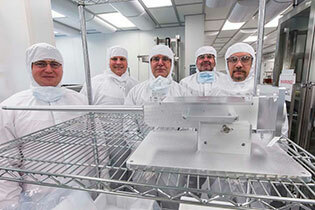 Shown is senior manufacturing engineer John Szczepanski with the assembled unit. Also shown is the project team consisting of Milt Shoup, John Szczepanski, Johan Frenje (MIT), Mark Bedzyk, Jason Magoon, and Tony Agliata (group), and MIT graduate students Hans Rinderknecht and Hong Sio (below). The next-generation neutron temporal diagnostic (cryoNTD) will be used for high-yield cryogenic DT experiments beginning in February. The design of this instrument is based on the current neutron temporal diagnostic (NTD). The picture shows the installation of the cryoNTD nose cone assembly into the target chamber. The light from the scintillator inside the nose cone assembly is relayed approximately 16 m (52.5 ft) to a ROSS streak camera located in the OMEGA EP plenum area. The location in the plenum improves the neutron shielding of the camera by a factor of 100 relative to the current NTD. The resulting higher signal-to-background will reduce the error associated with determining the temporal width of the neutron production in the cryogenic implosions. The burn width is used to infer the pressure achieved in the DT fuel (peak pressures are approaching 50 billion atmospheres), a key performance metric in assessing the quality of an implosion. This target is used for x-ray Thomson-scattering measurements on OMEGA EP to measure the plasma properties of foam materials that are shocked by intense laser beams. The foam material and the parts of the container were manufactured by Schafer corporation located in Livermore CA, while the final assembly was performed by the LLE target fabrication department. The carbon-based foam (red) with a density of 350 mg/cm3 is encapsulated by a container (green) and by gold shields to protect it from preheat and to provide a definite and unperturbed measurement of the scattered x rays. The photograph shows the view from the drive beams. 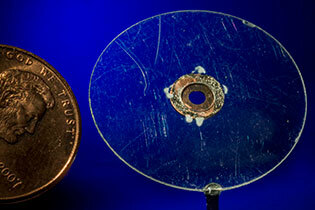 The surface of the red circular foam material shines through transparent layers of 50 µm of quartz and plastic. The x rays are generated on a nickel foil mounted on the top and propagate through a collimator to the foam material where they scatter by 90° to emerge through a small aperture behind the gold shield to the imaging x-ray Thomson spectrometer (IXTS). IXTS was developed by Los Alamos National Laboratory in collaboration with the University of Michigan. 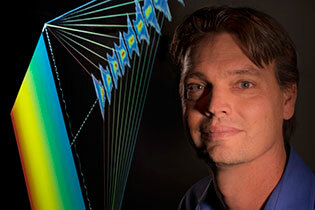 Senior scientist Christophe Dorrer, a member of the Laser Technology Development group, was elected a Fellow by the Board of Directors of The Optical Society (OSA). He was recognized "for the invention of methods and devices for the control and characterization of ultrafast optical pulses, with significant impact across a wide range of applications, from telecommunications to high-energy lasers." This award recognizes distinguished scientific achievement in the OSA. The next-generation cryo target will employ a new mounting stalk that is specifically designed to be insensitive to vibrational energy once aligned to the 60 beams of the OMEGA laser. Referred to as the "Type 1E target mount," the new stalk was adapted by Mechanical Engineering's Brian Rice from an original design by David Harding and Mark Bonino and uses a 17-µm-diam silicon carbide fiber to attach the cryogenic capsule to a polyimide tube that helps damp vibrations. The alignment-stability requirement is ~1% of the capsule diameter. These targets are filled with several hundred atmospheres of deuterium–tritium fuel and cooled to 19.6 K, or -424°F. Mathematical models, based on mechanical properties measured at 19.6 K, were used to select the target assembly materials and dimensions needed to ensure the stability requirement. Once irradiated by the 60 OMEGA beams, these capsules implode and produce fusion neutron yields of nearly 5 × 1013. Optical parametric amplifier (OPA) output-beam quality is sensitive to the pump-beam profile. Leva McIntire investigates optimizing OPA performance using programmable beam shaping with spatial light modulators to improve pump beams. Here, she aligns a phase corrector to a spatial light modulator for laser beam-shaping experiments in the Laser Development Lab. The 40-in. coating chamber in the Optical Manufacturing (OMAN) group has been configured to produce coatings by glancing-angle deposition (GLAD). These electron-beam evaporated coatings condense on the surface of the substrate at a high angle of incidence, forming a birefringent film with an oriented columnar structure. By translating the substrate behind an aperture, the surface may be patterned with coated regions of quarter- and half-wave plates. Such a component enables spatially varying manipulation of incident polarization. Vern Gruschow and Jim Oliver of OMAN are shown with a 2-in test sample coated in the system along with the insert showing the film structure. LLE's new isotope separation system (ISS) will provide a flexible tritium fuel supply and will ensure that the purity of that fuel supply meets LLE's baseline inertial confinement fusion program requirements. The ISS will recover tritium from existing, unusable spent DT fuel, eliminate the need to ship tritium to/from external cleanup facilities, and provide LLE with the ability to examine fusion reactions at DT ratios other than 1:1. 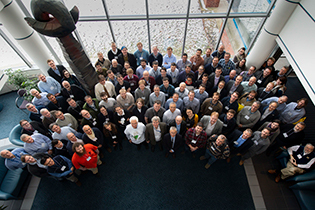 The Sixth Omega Laser Facility Users Group Workshop was held 23–25 April 2014. This year, presentations included posters given by three participants in LLE's 2013 Summer High School Research Program. Eric Hwang (left) of Penfield High School is now attending the University of Michigan. Yifan Kong (center) of Webster Schroeder High School was a semifinalist in the 2014 Intel Science Talent Search competition and is now attending Harvard University. Sam Goodman (right) of Pittsford Mendon High School is now attending Duke University. A more-detailed description of their projects is available here. The second and third generation of gas Cherenkov detectors, GCD-2 and -3, sit in the foreground next to one of the ten-inch manipulators, which are used to insert these instruments into the OMEGA target chamber. In the background is OMEGA Experimental System Technician Dan Neyland at the portable manifold, which is part of the system that allows the detector to be evacuated or pressurized with different gasses remotely from below the Target Bay. The third-generation gas Cherenkov detector, used on recent experiments by Los Alamos National Laboratory, records the multitude of gamma rays produced during inertial confinement fusion (ICF) implosions. 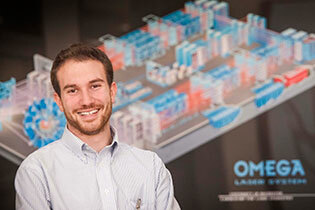 Collin Stillman has been awarded a 2014–2015 DOE NNSA Stewardship Science Graduate Fellowship. Collin is finishing his first year of graduate school in the Physics and Astronomy Department and has been conducting research in high-energy-density science as part of the Plasma and Ultrafast Physics Group at LLE. Collin's research focuses on high-precision, equation-of-state measurements using a novel technique to observe shock-wave propagation within solid targets. An equivalent-target-plane diagnostic is shown being used to evaluate a new distributed phase plate (DPP) for the OMEGA Laser System. The diagnostic is situated on the same optical table that is used for ultraviolet holographic recording. An off-axis parabola (OAP) is used to expand a laser beam to the required clear aperture, while a second OAP and a series of interchangeable optics are used to form a magnified focal spot. 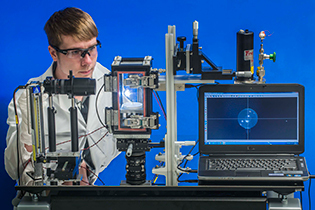 An R80 DPP (left), is being characterized within this test facility by Charles Kellogg, a member of the Optical and Imaging Sciences group. 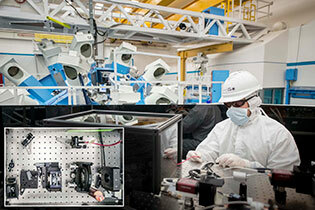 The mirror in the background is used to direct the expanded beam through the test optic. In addition to attending most of their classes on the River Campus, University students also attend classes at LLE. Shown are those attending Optics 443, Optical Fabrication and Testing. Stephen Jacobs, Professor of Optics and Chemical Engineering and LLE Senior Scientist, has been teaching this course for almost 40 years. Apprentice Mike Kaplun and master optician Alex Maltsev are their lab instructors in the optical fabrication shop. In front is visiting lecturer, Ed Fess, the R&D manager from OptiPro Systems, a local company that provides manufacturing technology for precision optical fabrication. 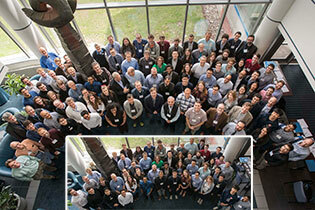 The Sixth Omega Laser Facility Users Group Workshop, held 23–25 April 2014, attracted 115 researchers from around the world. The purpose of the workshop is to facilitate a continuing dialog among the individual users and between the users and LLE. Most of the 90 contributed posters were given by students and postdocs in attendance. The next workshop will be held 22–24 April 2015. 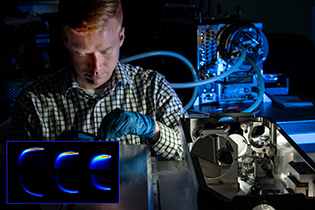 Rory Hamilton, a University of Rochester graduate, is shown here working on the commissioning of an x-ray detection system to measure electron-induced x-ray emission from targets filled with tritium gas. For glass targets, the silicon and oxygen Kα fluorescence lines dominate the emission spectrum, which enable the determination of the tritium fill pressure. The strength of these lines depends on the tritium partial pressure in the target. In the case of plastic targets, two components are responsible for a broadband, x-ray emission: decay electrons produced by tritium gas in the target and decay electrons originating from tritium bound in the wall of the targets. The detection system can determine the pressure in both glass and plastic targets from the measured activity as well as measure the tritium permeation time constant from plastic targets. 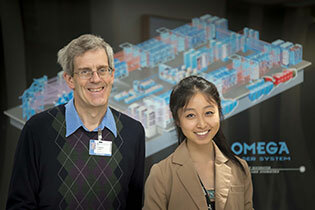 The Omega Laser Facility provides opportunities for unique international research collaborations. In one week, experimenters included scientists from the Atomic Weapons Establishment (AWE, UK), Commissariat à l'énergie atomique (CEA, France), Institut Supérieur de l'Aéronautique et de l'Espace (ISAE, France), Lawrence Livermore National Laboratory (LLNL), Los Alamos National Laboratory (LANL), Massachusetts Institute of Technology (MIT), and Université Jean Monnet–Saint-Etienne (UJM, France), and LLE. 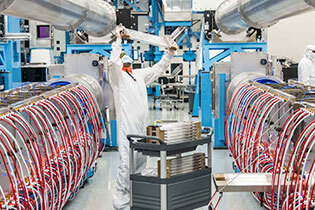 Experiments by outside investigators at the Omega Laser Facility require compliance with LLE safety regulations. In turn, to verify assurance for the home institution, visitors are welcome. During one such visit, shown left to right, are LLE's Radiation Safety Officer, Walter Shmayda, and Chief Safety Officer, Doug Jacobs-Perkins, as well as Wal Provart and Dave Egan from the Orion Laser Facility in the United Kingdom. One of the primary missions of the Laboratory for Laser Energetics is the education and training of students, ranging from local high school students to graduate students. 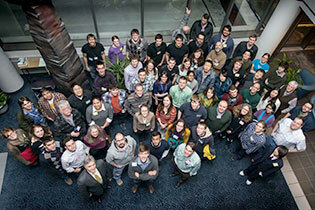 Shown above are participants from the "Graduating Students Recruiting Weekend" sponsored by the Department of Physics and Astronomy. Administered by Dustin Froula and David Meyerhofer, with the help of their graduate students, the visits included tours of both the OMEGA and OMEGA EP Laser Systems. With 28 collaborating faculty members from five University departments, LLE has 80 graduate students currently pursuing their doctorates. 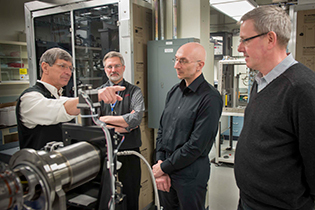 In preparation for the OMEGA calibration shots, the NIF x-ray spectrometer (NXS) is shown with the development team consisting of Sean Regan, Milt Shoup, Mark Bedzyk, Chad Abbott, and Tim Clark. 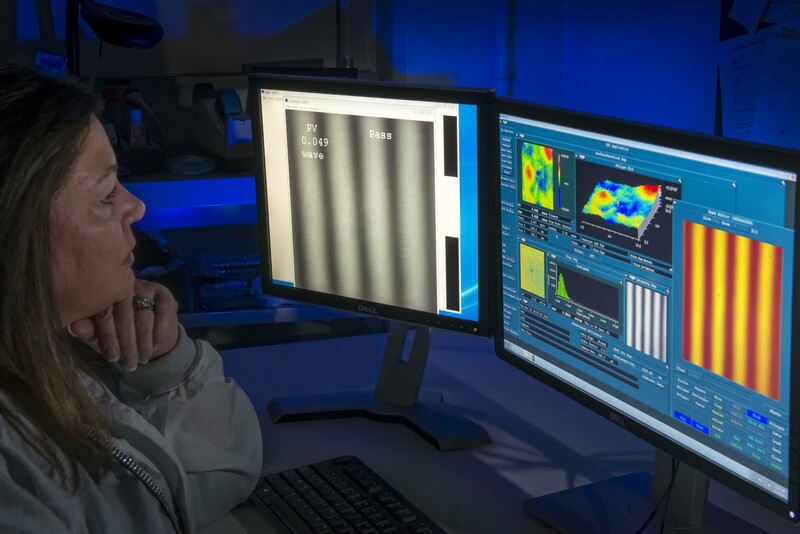 Funded by the Defense Threat Reduction Agency, this time-resolved x-ray spectrometer for the National Ignition Facility was designed, fabricated, and calibrated by LLE through a contract with Lawrence Livermore National Laboratory. LLE's Machine Shop manager Richard Fellows displays a row of eight individual parts, each of which will be used in the next-generation planar cryo target. Once assembled, these new targets will be used to optimize use of the OMEGA high-resolution velocimeter system. Many intricate designs are designed and assembled in-house to support the Omega Laser Facility. As part of their Ph.D. training at the University, graduate students and LLE Horton Fellows Kaitlin Wozniak (Optics) and Debbie Saulnier (ChE) were given a tour of the OMEGA EP Sources Bay by Senior Scientist Christophe Dorrer. Brittany Taylor, an engineer in the Materials Technologies Group, also participated in the tour. All collaborate with Senior Scientist Stephen Jacobs and Research Chemist Kenneth Marshall on the development of liquid crystal optics for use on the Omega Laser Facility. During the tour, special attention was given to OMEGA EP's high-fluence apodizer for short-pulse operation and the programmable spatial-light modulator (PSLIM) for long-pulse operation. Scientists and support staff from around the world visit LLE's Omega Laser Facility on a routine basis to use the OMEGA Laser System, the OMEGA EP System, or both. Collaborators shown here came from Lawrence Livermore National Laboratory, Princeton University, Massachusetts Institute of Technology, and LLE. These particular experiments investigated astrophysical collisionless shocks using the OMEGA laser. Scientists Peter Celliers (LLNL, left) and Tom Boehly (LLE, right) set up the OMEGA high-resolution velocimeter (OHRV) system in the OMEGA Target Bay. The OHRV is able to capture a 2-ps, 2-D "image" of a shock front velocity profile with high spatial and temporal resolution. These profiles can be used to study the viscosity of shocked materials and to quantify the effect of laser imprinting on shock uniformity. 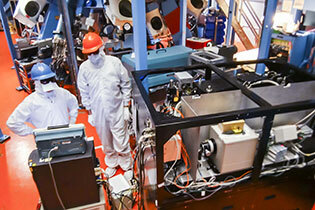 The device is seen to the right in this image and comprises a probe laser, two interferometers, and a streak camera. A new "stopping-power" target design is being used to generate a warm-dense-matter plasma, where partially degenerate electrons are used to study the slowing down of energetic charged particles. The physics of particle slowing in this particular plasma regime has never before been studied experimentally. These experiments are being conducted by scientists from the Massachusetts Institute of Technology, including Alex Zylstra, Chikang Li, and Hong Sio through the National Laser Users' Facility based at LLE. 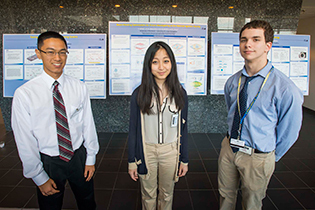 Yifan Kong (right) was named a semifinalist in the 2014 Intel Science Talent Search. Kong, advised by Dr. Stephen Craxton (left), is a student at Webster Schroeder High School. 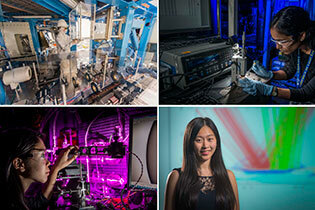 She optimized beam pointings for proton-backlighting targets at the National Ignition Facility for an experiment proposed by MIT's Chikang Li. The Science Talent Search is often referred to as the "Junior Nobel Prize" and is the nation's oldest and most prestigious pre-college science competition. Since its inception in 1989, LLE's summer research program has produced 32 semifinalists and 4 finalists. Application forms for the 2014 program will be available in early February and can be found here. LLE is designated a "Fight Building," which means that trained LLE personnel may fight a small and contained fire in which there is a clear exit. 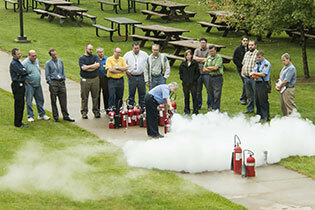 To provide training, the Laboratory offered an on-site fire-fighting safety class through the University's Fire Safety Unit, coordinated by LLE facilities manager, John Sawyer. Shown is the University's Fire Safety Coordinator, Kathy Weaver, demonstrating the proper use of a fire extinguisher to put out a staged fire. Twenty-three individuals participated in several sessions. Additional information may be found at LLE's Safety Zone Web Site. Instrument specialists Andrew Sorce and Joshua Kendrick (not pictured) have realigned a velocity interferometer (VISAR), along with two Rochester Optical Streak System (ROSS) streak cameras used in the active shock breakout (ASBO) diagnostic for the OMEGA EP Laser System. Originally installed in 2009, the entire system was removed to a separate laboratory so that its optical systems could be adjusted and realigned to provide optimal on-shot performance. Shock waves in targets driven by OMEGA EP produce a Doppler shift in the probe beam that is detected by modified Mach–Zehnder interferometers, which require precise and stable alignment. The electronics in the MIFEDS (magneto-inertial fusion electrical discharge system) used in magnetized plasma experiments have been extensively redesigned to improve reliability and make the unit more user friendly. The updates include new storage capacitors that quadruple the stored energy, an updated charging power supply, and a new pressurized metal-ceramic triggered spark gap. All the components are housed in an aluminum monocoque enclosure and connected to the magnetic coils via a coaxial vacuum transmission line. The MIFEDS operations are controlled with a laptop-based, custom-built graphical user interface via a compact control "suitcase." Shown is Larry Folnsbee finishing up the assembly. 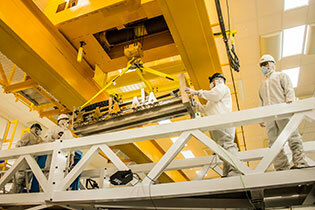 A new neutron time-of-flight (nTOF) detector has been qualified for use on OMEGA. The detector is similar to an earlier device but has a larger scintillator volume for improved signal-to-noise measurements of deuterium–tritium fusion neutrons that scatter in the compressed fuel of cryogenic implosions. The spectrum of the scattered fusion neutrons is one of the key measurements used to infer the implosion performance. The new detector includes additional photomultiplier tubes configured to measure different parts of the neutron spectrum emitted during such implosions. All of the neutron-spectrum–based implosion performance measurements can now be made along a single line of sight from the target. The red ellipse shows the location of the hole in the Target Bay floor that is part of the collimated line of sight from target chamber center to the detector. Medical emergencies require a deliberate and rapid response. LLE has nearly 60 staff members trained in first aid, cardiopulmonary resuscitation, and use of automated external defibrillators. 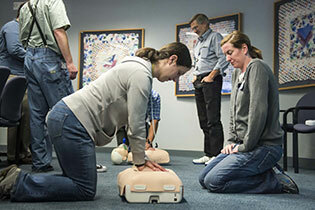 Annual training is provided at LLE by American Heart Association certified instructors. Jennifer O'Sullivan and Karen Cera are shown performing compressions on a specialized mannequin during a two-person CPR drill at a recent training session. 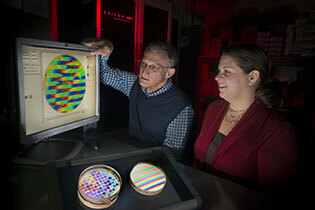 Steve Jacobs and Brittany Taylor examine a scan of optical rotatory power for a striped distributed polarization rotator (DPR) device made from liquid crystals (LC's). The 100-mm-diam optic was automatically mapped during a weekend in the UV (at 355 nm) at a 0.5-mm lateral resolution over 68 hours with a Hinds Exicor Mueller Matrix Polarimeter. Older LC DPR device concepts are shown in the foreground. 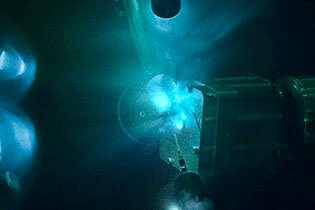 Short-pulse beams from the OMEGA EP Laser System may be used in the OMEGA Laser System. They travel through the shield wall to the target chamber through transport tubes. These tubes can be seen from the OMEGA EP visitors gallery by looking at the junction between the grating compressor chamber and the shield wall, and are seen on the right-hand side when viewed from the gallery. 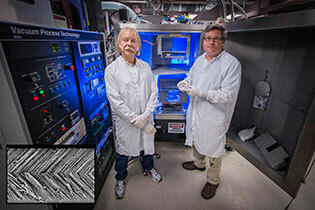 Glancing-angle–deposited (GLAD) films are evaluated on a Zeiss 1530 scanning electron microscope by Jim Oliver and Chris Smith of the Optical Manufacturing Group. The birefringent film structure created by the GLAD process allows for control of the polarization state of the incident light, enabling the vacuum deposition of wave-plate coatings. Such coatings have a potential application to large-aperture distributed-phase rotators, and high-resolution SEM imaging is critical to characterize and understand the deposited film. 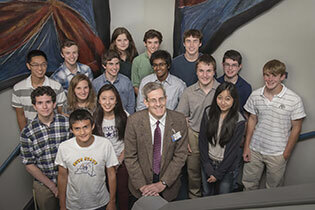 The High School Summer Research Program just completed its 25th year at LLE. High school students from around the Rochester area have been working and learning at the Laboratory, investigating real-world problems while being supervised by scientists and engineers since the program began in 1989. The eight-week program provides an exceptional opportunity for students to experience scientific research in a realistic environment. Students are assigned to a research project that is an integral part of the Laboratory research program. The neutron temporal diagnostic (NTD) measures the temporal history of neutron production in inertial confinement fusion implosions, and it was recently upgraded to improve reliability and functionality. The temporal history measurement is used to infer important performance parameters from cryogenic deuterium–tritium implosions at LLE (e.g., bang time, burn rate, and peak pressure in the fuel). The new hardware improves the impulse response of the instrument, which will reduce the uncertainty in these performance parameters. The image shows part of the new NTD assembly being lowered into the target chamber during installation at the end of June 2013. Under the supervision of Dr. David Harding, Brighton High School student Erin Wang is shown preparing to disconnect the main gas line that feeds deuterium into a cryogenic calorimetry cell. This is part of the process to change a zinc crystal used to seed the growth of solid deuterium while preventing the liquid from supercooling below its triple-point temperature. The calorimetry cell is a surrogate for a cryogenic target. It measures the amount of heat flowing when the deuterium melts and freezes. This allows one to study the thermodynamics of deuterium at its solid–liquid phase boundary. In its 25th year, LLE's Summer Research Program for High School Juniors has had 312 participants, 94 of whom have received advanced degrees. 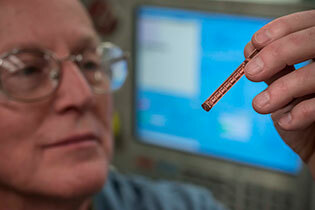 A new type of coil for magnetized plasma experiments at LLE has been designed and fabricated. The coils consist of several turns of Kapton-insulated wire wound around a nylon coil form. The multi-turn design results in a high magnetic field. The coil form itself is 3-D printed, which allows for virtually an unlimited number of possible precise configurations. Situated on the floor of the OMEGA Target Bay, a midbeam collimator is positioned between the target chamber and an advanced neutron time-of-flight (nTOF) detector. The nTOF detector is used to measure the neutron spectrum emitted from deuterium–tritium (DT) fusion reactions in cryogenic implosions. Analysis of the spectrum provides important information on the implosion performance. DT neutrons scattered from the target chamber and other structures in the Target Bay can distort the shape of the measured neutron spectrum, leading to incorrect conclusions about the implosion. 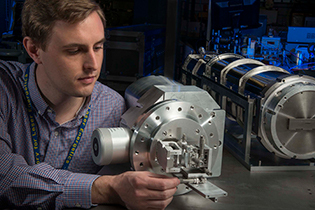 Neutron transport simulations, common in the nuclear power industry, were used by University of Rochester physics graduate student Chad Forrest (shown aligning the collimator) to define the field of view required for the collimator to mitigate a background of scattered neutrons. A new generation of x-ray framing cameras is now being used on OMEGA. The camera was developed by Sydor Instruments in Rochester, NY to meet the requirements of the experimental program here at LLE. The first use of the new Sydor x-ray framing camera (SFC) in June produced first-of-a-kind images of an imploding cryogenic deuterium–tritium capsule. The camera captures up to 16 sequential, temporally gated images—a short movie of nanosecond-scale phenomena. The data will be used to validate the experimental design. Here, Ray Bahr is shown assembling the SFC in the staging laboratory prior to the first use. 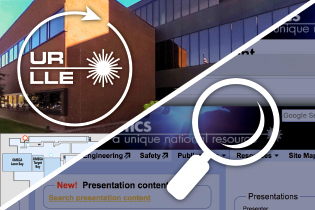 For almost 45 years, the weekly Research and Review lecture series has been highlighting the work of LLE scientists and engineers, and presenting the latest in LLE advances. The series includes presentations from the theory, experimental, and laser facilities divisions. Shown is scientist Matthias Hohenberger who recently spoke on his polar-drive experiments and experiences as a Principal Investigator at the Lawrence Livermore National Laboratory. LLE recently unveiled an Illustrated History display of the more than 40-year timeline of the Laboratory, starting before 1970 and running through this past year. 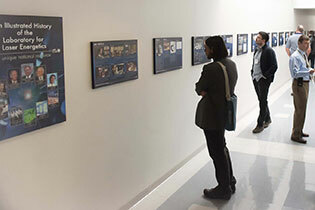 The display currently contains 29 panels and spans almost 90 feet in the upstairs corridor of the building to highlight the many milestones and achievements of the Laboratory. The panels also tie in to the digital timeline located on the LLE website, which can be found here. 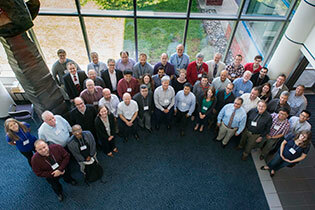 The Fifth Omega Laser Facility Users Group Workshop was held 24–26 April 2013. This year, presentations included posters given by three participants in LLE's 2012 Summer High School Research Program. Emily Armstrong (left), who attends Our Lady of Mercy High School, was a semifinalist in the 2013 Intel Science Talent Search competition. Christa Caggiano (center) attends Victor Senior High School, and Raz Rivlis (right) attends Brighton High School. A more detailed description of their projects is available here. This summer the Summer High School Research Program will begin its 25th year on 8 July 2013. Optical Manufacturing Group Leader, Amy Rigatti, was recently nominated for the 2013 Technology Woman of the Year by Digital Rochester. She was recognized for sustained contributions to her field, advancing the status, opportunities, and employment for women in the technology profession, and her community service in the Rochester area. Amy has worked at the Laboratory for over 22 years, is a member of the Optical Society of America, and is on the program committee for SPIE's Boulder Damage Symposium. She has also contributed to many technical papers in the area of high-damage-threshold optical coatings and regularly presents her work at professional meetings. 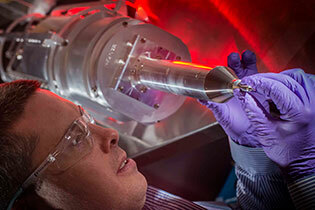 Senior manufacturing engineer Karl Lintz inspects an x-ray Thomson-scattering (XRTS) planar cryogenic target that will be used to measure collective x-ray scattering from shocked liquid deuterium on OMEGA. The target, designed and fabricated entirely at LLE, has a 40° scattering geometry. XRTS is a primary diagnostic technique used to probe the plasma conditions of high-energy-density–physics plasmas created for inertial confinement fusion research or laboratory astrophysics experiments. XRTS research at LLE involves scientists from around the world. Rapid turnaround of data is essential in conducting experiments at LLE and is made possible by the use of a new "film." Although the Omega Laser Facility conducts a one hour shot cycle, the configuration of the next shot is sometimes delayed until film processing is complete. A new approach using radiographic film provides critical feedback to experimentalists within minutes. 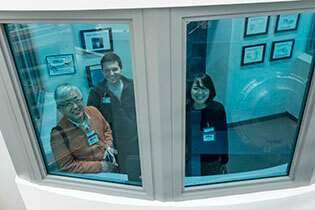 Shown with a batch of processed radiographic film is principal investigator Channing Huntington (LLNL), along with scientists Hye-Sook Park (LLNL), Damiano Caprioli and Anatoly Spitkovsky (Princeton University), Gennady Fiksel (LLE), and Dmitri Ryutov (LLNL). They are examining data from an OMEGA EP shot as part of their study of astrophysical collisionless shocks. Seen in the upper left are four beamlines of OMEGA EP firing during a target shot. Riding along with those four beamlines is the 4ω probe illuminated in its housing in the lower right and next to the grating compressor chamber. The green irradiation stems from the frequency conversion of the primary infrared beam to the second harmonic or 527 nm. Remotely triggered, the image was captured from the top of the target area structure with no bay lights on. Installed and being activated on OMEGA EP Beamlines 3 and 4, the programmable spatial light modulator (PSLIM) is being used to improve output beam uniformity, which currently limits UV energy delivered to target. PSLIM is a high-resolution, closed-loop beam-shaping system that consists of a spatial light modulator (shown above held by Matthew Barczys) installed at an image plane in the front end of each beamline. The spatial light modulator alters the beam profile by applying a phase term in a 2-D array to the beam such that a prescribed amount of energy is removed at the next spatial filter in the system. A dedicated, custom-built, wavefront sensor is used to provide feedback during beam shaping and achieve the desired near-field profile without adversely affecting the wavefront. Shown are (left to right) Seung-Whan Bahk, Matthew Barczys, and Mike Spilatro. The Science and Technology Seminar series, hosted by LLE for over 28 years, features weekly presentations from experts in their fields. Recently, Dr. Catherine Cerulli, Director of the Susan B. Anthony Center for Women's Leadership and the Laboratory of Interpersonal Violence and Victimization and Associate Professor from the URMC Department of Psychiatry presented a talk on "Using a Public Health Approach to Reduce Violence." Her talk enhanced the awareness of domestic violence and called for finding better detection techniques. Dr. Cerulli (right) was introduced by Dr. Jie Qiao (left), who, along with Dr. Jacques Delettrez are chairing the S&T seminar series for the 2012–2013 academic year. A listing of upcoming and past seminars is available here. Shown is the first image obtained with the 4ω probe diagnostic implemented on the OMEGA EP Laser System. Operating at a wavelength of 263 nm, the probe beam illuminates a channel dug into a preformed plasma with a 1200-J infrared channeling beam. The f/2 focusing cone of the IR beam is shown in red. Data obtained with this diagnostic will provide a new view of plasmas relevant for inertial confinement fusion. 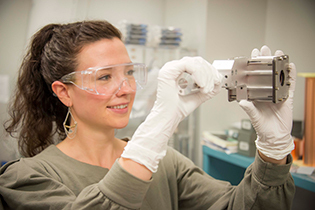 Laboratory engineer Brittany Taylor is shown with a liquid crystal circular polarizer (LCP), an optic used in the IR portion of the OMEGA Laser System. This optic is being loaded onto the measuring area of the Exicor 450XT Mueller Matrix polarimeter. This instrument measures linear retardance, diattenuation, and rotation of optics in the ultraviolet region, specifically at 355 nm. We have observed significant amounts of optical rotation in the UV for LCP's, for which there are a variety of possible applications. 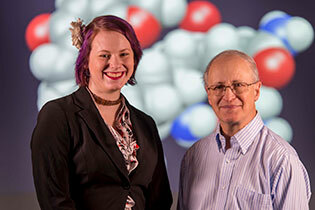 Emily Armstrong has been named a semifinalist in the 2013 Intel Science Talent Search (Intel STS). Our 31st semifinalist and a student at Our Lady of Mercy High School, Armstrong was advised by scientists Brian Kruschwitz (left) and Matthew Barczys. She investigated the feasibility of using a Hartmann sensor to make wavefront measurements of high-power ultraviolet lasers. The Intel STS is often referred to as the "Junior Nobel Prize" and is the nation's oldest and most prestigious pre-college science competition, counting seven Nobel Prize winners among its alumni. LLE's Summer Research Program has produced 31 semifinalists, including 4 finalists, since its inception in 1989. 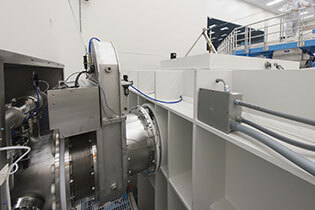 The newly constructed Damage Testing Laboratory features a picosecond-pulse testing station (left to center) with a vacuum-damage-testing capability (vacuum chamber is on the front-left) and a nanosecond-pulse station shown on the center-to-right side. The members of the damage testing group are (left to right) Alexei Kozlov, Semyon Papernov, and Brittany Taylor. The fourth person in the picture is senior scientist Andrey Okishev, who designed and built the high-performance nanosecond-pulse laser. In preparation for cryogenic target shots, Moving Cryostat Transfer Carts (MCTC) are positioned below the OMEGA Target Bay. One of the carts is partially seen (behind the support post) secured under the lower pylon. Cryogenic and Tritium Facility MCTC Technician, Desirée Whitaker, is shown securing one of the carts, while experimental operations technician, Matt Maslyn, prepares for the next cryogenic campaign. The 96th Annual Meeting of the Optical Society of America, Frontiers in Optics 2012, and the 28th meeting of the American Physical Society Division of Laser Science met for five days in Rochester. As part of the program, a variety of special events included a tour at LLE that brought together 48 individuals from 16 countries comprising 38 institutions and universities. The tour participants enjoyed viewing the OMEGA and OMEGA EP Laser Systems and interacting with the scientists, engineers, and students working here. The OMEGA EP 4ω probe diagnostic system will use a 10-ps, 263-nm laser pulse to illuminate target interactions. 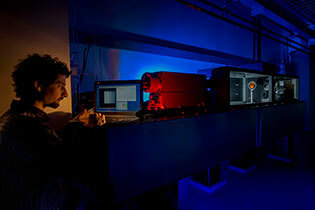 The light refracts through the plasma allowing various diagnostics to study laser–plasma interactions. 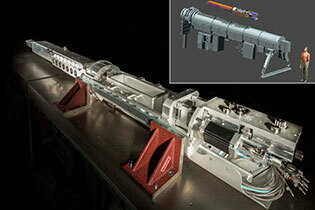 An optical collection system will provide access to high-density, large-scale-length, laser-produced plasmas. LLE engineer Raymond Huff is shown characterizing the 4ω probe laser beam at a relay image plane of target chamber center, which is attached to the OMEGA EP target chamber (partially visible in the background). Cryogenic targets are assembled in a Class-100 cleanroom using a target assembly station consisting of a microscope, motion stages with micrometer positional control, and cameras. The assembler is shown attaching an 865-µm-diameter capsule to a 17-µm-diameter silicon-carbide fiber, as viewed in the computer monitor on the left. All the assembly and characterization processes are performed in the cleanroom environment to maintain the cleanliness of the target's surface. The target is then processed in the Cryogenic Target Handling System. Radially polarized beams are desirable for their advantages in laser cutting, high-resolution microscopy, and optical trapping. Christa Caggiano, a participant in LLE's Summer Research Program for High School Juniors, is shown holding a photoaligned liquid crystal device she made that converts linearly polarized light to radially polarized light. The background image is a previously captured far field of a radially polarized beam, which is a doughnut-shaped intensity distribution. 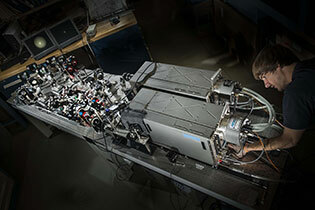 An equivalent-target-plane diagnostic has been constructed to evaluate phase plates used on either the National Ignition Facility (NIF), OMEGA 60, or OMEGA EP Laser Systems. The diagnostic was built on the same optical table that is used for ultraviolet holographic recording. An off-axis parabola (OAP) is used to expand a laser beam to the required clear aperture, while a second OAP is used to form either a magnified focal spot or quasi-near-field beam pattern. 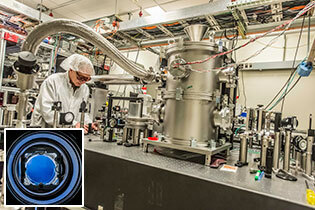 A NIF phase plate, shown positioned at the lower right, is being characterized within this test facility by optics engineers Jo Bunkenburg and Charles Kellogg. Optics inspectors Scott Hylas (left) and Mark Bowman (right) examine the large UV-beam reflecting mirrors on OMEGA's north-end mirror structure. Working 15 ft off the ground floor, Scott is also harnessed to the structure. There are a total of 120 large mirrors, with the second set residing on the target mirror structure (white containers seen in the Quick Shot from 08/01/11). The sixty focusing lenses and distributed phase plates found near the target chamber are more difficult to access and maintain. The High School Summer Research Program begins its 24th year at LLE with 16 high school students investigating real-world problems while being supervised by scientists and engineers at the Laboratory. 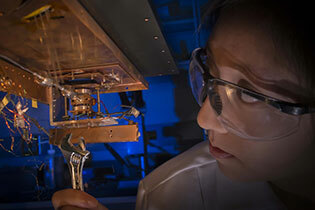 Shown is Aimee Owens along with her advisor, system scientist Tanya Kosc, at a liquid crystal circular polarizer (LCP). Tasked with identifying and testing possible degradation mechanisms, she is being shown the test fixture and technique for measuring the LCP's in situ in the OMEGA Laser Bay. A picosecond-pumped ultrafast optical parametric amplifier (UOPA) has been deployed on OMEGA EP to enhance temporal contrast and to support additional user experiments. Seen here working on one of the UOPA's in the Laser Development Laboratory are senior research engineer Rick Roides (left) and senior scientist Christophe Dorrer (right). On 21 May 2012 in Washington DC, Dr. Riccardo Betti accepted the Ernest Orlando Lawrence Award from Department of Energy Secretary Steven Chu for research in fusion and plasma sciences. The E.O. Lawrence Award honors scientists for their exceptional contributions in research and development in support of the Department of Energy. Dr. Betti is Professor and Director of the Fusion Science Center of Extreme States of Matter and Fast Ignition, University of Rochester, and Assistant Director for Academic Affairs at LLE. In 2009, he was awarded the Edward Teller medal for pioneering research and leadership in inertial fusion sciences and applications. The Laboratory for Laser Energetics is a world leader in developing smoothing by spectral dispersion (SSD) which has been shown to be critical for the success of direct-drive target implosions. The latest innovation is this prototype Multi-FM SSD system for the National Ignition Facility (NIF), which has been integrated into the OMEGA EP Laser System. The modified OMEGA EP beamline allows for experimental validation of this novel beam-smoothing capability before its implementation onto the NIF Laser System. Since its introduction in the 21 May 2008 Quick Shot, the National Ignition Facility (NIF) preamplifier module (PAM), shown here installed in the OMEGA EP Sources Bay, has been used to test Multi-FM 1-D smoothing by spectral dispersion (SSD), a beam-smoothing technique that will be implemented on the NIF. 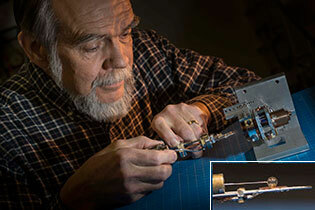 At the PAM is Laser Sources Engineer Albert Consentino. Multilayer dielectric (MLD) diffraction gratings, used in OMEGA EP's pulse compressors, must be cleaned with aggressive chemicals to remove manufacturing residues. 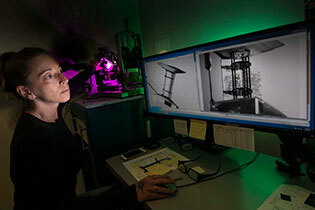 Here, Horton Fellow Heather Howard uses Nomarski differential interference contrast (DIC) microscopy to inspect an MLD grating coupon for defects and mechanical damage following chemical cleaning. The Fourth Omega Laser Facility Users Group Workshop, held 25–27 April 2012, attracted over 100 researchers from 19 universities, 18 centers and laboratories, and 9 foreign countries. The purpose of the workshop is to facilitate a continuing dialog among the individual users and between the users and LLE. Most of the 75 contributed presentations were given by the 50 Ph.D. students and postdocs in attendance. 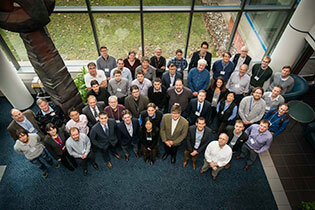 The next workshop will be held 24–26 April 2013, with an Omega users meeting at APS on 30 October 2012. More information about the Omega Facility Users Group can be found here. Maintaining the OMEGA Laser System requires a highly trained staff, especially with over 4,500 optics, 216 amplifiers, 6,672 flash lamps, and approximately 12 miles of high-voltage PFN cable. 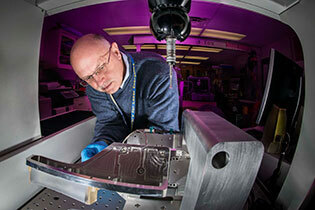 This view shows Amplifier Technician Josh Reindl accessing the flash lamps in one of the 60 beamlines. Flash lamps, which are used to stimulate the laser pulse as it travels, require periodic inspection. They are modular and can be replaced in between laser shots if necessary. The Osaka University electron spectrometer (OU-ESM) measures fast electrons produced during fast-ignition experiments. Developed by a group headed by Professor Kazuo Tanaka at the Institute of Laser Engineering, Japan, it is a ten-inch manipulator–based diagnostic for the OMEGA target chamber. The OU-ESM is capable of measuring escaping electrons with different view angles covering 25° in 5° increments, over a few tens-of-MeV detection range with high-energy resolution. A very strong magnetic field (4.5 kilogauss between the poles) disperses the electron spectrum onto an image plate detector. Adhesives play an increasingly important role in cryogenic experiments. To better understand their effectiveness at these temperatures, Mackenzie Hall is shown mounting a sample of an adhesive into a dynamic mechanical analyzer. This instrument not only tests the properties of the adhesive at these very cold temperatures as a function of applied vibrational frequencies, but also determines their upper fatigue limit when used to attach cryogenic pellets to their stalks. 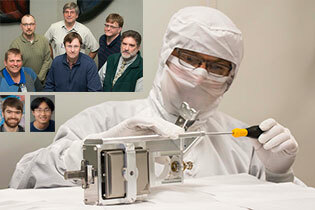 The streak camera upgrade for the streaked optical pyrometer (SOP) system has been completed. Located in the OMEGA target bay, the SOP cabinet houses the Rochester Optical Streak System (ROSS) shown in its base.The SOP detects self-emission from materials that are compressed by laser-driven shocks and is used to infer temperatures of compressed samples under study. Initial experiments indicate that use of the ROSS provided a higher signal-to-noise ratio than the previous system. In preparation for cryogenic target shots, the area below the OMEGA Target Bay is dedicated to 5,000-lb carts which travel on air from their fill transfer station. Four of the moving cryostat transfer carts (MCTC's) are shown ready for docking with the target chamber during a recent campaign. With MCTC Operations Engineer, Vera Versteeg, at one of the displays, real-time imaging of the cryogenically cooled target (maintained at 19.5 K) is possible. A view of the OMEGA Target Bay displays many uncommon, mystifying, and sometimes moving objects. As shown, the crane is being used to carry a large, torpedo-shaped instrument to the OMEGA target chamber. Although high-speed cameras look similar, the parabola alignment diagnostic (PAD), carefully handled by Harold Beck, is used to align and optimize the short-pulse optics. Built in-house, the PAD provides submicron measurements with an internal pointing camera and wavefront sensor. 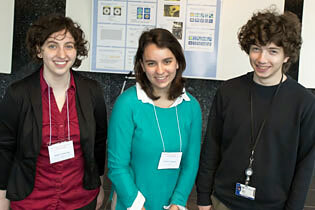 Patricia Olson (right) was named a semifinalist in the 2012 Intel Science Talent Search. Olson, advised by Dr. Stephen Craxton (left), is a student at Brighton High School. She optimized beam configurations for shock-ignition experiments on both OMEGA and the National Ignition Facility. The Science Talent Search is often referred to as the "Junior Nobel Prize" and is the nation's oldest and most prestigious pre-college science competition. Since its inception in 1989, LLE's summer research program has produced 30 semifinalists and 4 finalists. Application forms for the 2012 program will be available in early February. Although periodic safety inspections are carried out at the Omega Laser Facility, special attention to safety is paid to any major upgrades within the systems. Shown is Matt Moore (left) describing the upgrade of OMEGA EP's infrared alignment table to Doug Jacobs-Perkins, LLE's Chief Safety Officer. LLE continues to make strides in pursuit of the perfectly formed target. Introduced in a previous Quick Shot (05/09/11), the shroud cooler has been installed in Fill/ Transfer Station 1 (FTS-1). Accessing the chamber in which targets are filled with hydrogen isotopes is infrequent and requires complicated efforts to carry it out. Under the dome is Mark Romanofsky fine-tuning the installation of the shroud cooler and guide rail plates. Photographic film continues to be a source for recording experimental results. After processing raw film data, Stephanie Dent is shown inspecting a two-inch-round piece of film used in an x-ray pinhole camera. When requested, these data are then scanned for further evaluation. There are currently 80 graduate students and 43 undergraduates at LLE. 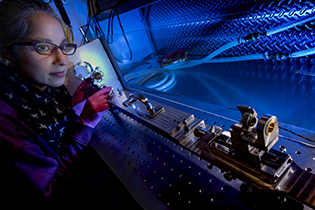 Shown is Debra Saulnier positioning a sample with the materials lab's NMR instrument. Debra has worked at LLE while attending the University's undergraduate program and is currently a doctoral candidate in the Chemical Engineering Department. Her work includes the synthesis of photoactive chiral and non-chiral near-IR transition-metal complexes and photoswitchable liquid crystal alignment layers for device applications in laser systems. The ten-foot-diameter OMEGA EP target chamber continues to be populated with various diagnostics and other equipment. Two 4ω probe wells (entrance tubes) were recently installed, one of which is seen in the center of the image just below a ten-inch manipulator (TIM-14) used to maneuver diagnostics into the target chamber. Shown is Jeff Rodas working on TIM-12. Planar cryogenic targets are transported within moving cryostats that are also used to position targets before they are shot by the OMEGA laser. A planar cryogenic target with its capillary fill tube is shown sitting atop its transport structures awaiting docking to the lower pylon on the OMEGA target chamber. The pulse stretcher for the ultra-broadband front-end project, partially visible in the lower left, uses two gratings and cylindrical Öffner mirrors to stretch 200-nm pulses to 750 ps before they are amplified. Shown are Matt Millecchia and Jake Bromage positioning the stretcher optics using the Faro arm before fine alignment. The heart of the ROSS (Rochester Optical Streak System) cameras is the streak tube. Shown here is the 2-ps-time-resolution P820 streak tube manufactured by Photonis (Brive, France). This tube will be packaged into the UROSS camera and used to diagnose the pulse shape on the OMEGA EP short-pulse beamlines. 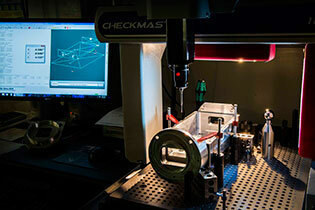 A new photoalignment process is being developed to produce liquid crystal (LC) devices. These devices will have substantially higher 1054-nm laser damage thresholds (between 30–40 J/cm2, at 1 ns) than those currently deployed in the OMEGA laser (e.g., LC wave plates ) that use buffed Nylon alignment coatings. Marisa Vargas is shown installing fused silica plates into a Brewster's angle pile-of-plates polarizer assembly that will be used to generate linearly polarized UV light for fabrication of large-aperture, photoaligned liquid crystal devices. The High School Summer Research Program just completed its 23rd year at LLE with 16 high school students investigating real-world problems while being supervised by scientists and engineers at the Laboratory. Shown is Madeline Rutan of Penfield High School holding a glass sample with which she examines abrasion-resistant sol-gel coatings. Her research advisor was Ken Marshall. This target, with a plastic spherical shell of diameter 860 µm, and a gold cone with an opening diameter of 3.5 mm, is used to study the Rayleigh–Taylor instability in spherical implosions. During the experiment, the shell is imaged by x-ray radiography using a Tantalum-foil backlighter irradiated by six OMEGA beams. The shell is doped with silicon of various concentrations to investigate the effect of radiation preheating on the dynamics of laser-imprinted perturbations. A view of the OMEGA Target Bay displays many uncommon, and sometimes mystifying, structures. For example, the center structure seen here houses a 10-ft-wide, spherical vacuum chamber designed to implode a target the size of a grain of sand. Although typically unseen, such targets must be manually introduced into the chamber. This image shows one of the targets being inserted into its positioner before being transported to the center of the chamber. Starting with a 53-lb block of aluminum, Ron Callari machined a spectrometer body weighing 5.5 lbs. These casings will house four x-ray Bragg crystals for use in the Supersnout II diagnostic. 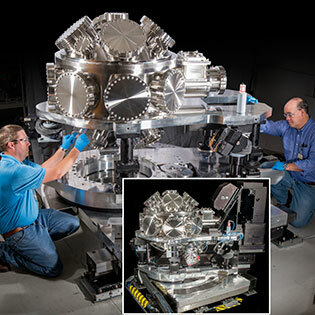 Designed at LLE, two identical instruments will be assembled, inspected, calibrated, and shipped to the National Ignition Facility for use on the National Ignition Campaign and in High-Energy-Density Physics experiments. Many components and assemblies used at LLE require very high precision manufacturing tolerances. Here, Tim Clark uses a portable coordinate measuring arm to acquire 3-dimensional, point-to-point measurements of a deformable mirror. This is one of several instruments available to verify incoming product quality by performing fast and in-depth inspections, CAD-to-part analysis, and reverse engineering. Continued improvements in the delivery of cryogenic targets to the center of the OMEGA target chamber have led to upgraded upper and lower thermal shrouds shown here. Housed in the moving cryostat transport cart, the lower shroud protects, cools, and positions the mounted target. During experimental operations, the upper shroud is quickly removed from near the target by a high-velocity retractor just prior to the shot. The south pole bang-time detector, one of several diagnostics designed and fabricated by LLE specifically for the National Ignition Facility (NIF), is shown here inside the NIF target chamber. This detector is used to determine the time of peak x-ray emission emanating from an imploded capsule along the hohlraum axis. Such information is essential in understanding the hydrodynamic response of fusion targets to the applied laser drive. The third Omega Laser Facility Users Group Workshop, held 27-29 April 2011, attracted over 115 researchers from 15 universities, 14 centers and laboratories, and 13 countries. The purpose of the workshop was to facilitate a continuing dialog among the individual users and between the users and LLE. Most of the 57 contributed presentations were given by the 50 students and postdoctoral candidates in attendance. The next workshop will be held 25-27 April 2012. The shroud cooler is used in the Fill/Transfer Station (FTS) as part of the cryogenic layering system. It is used to remove and keep the upper shroud cold during the target transfer process. This piece of equipment was fabricated in-house and will be installed in the FTS-1 upgrade when it goes down for maintenance. A crew from the Space Telescope Science Institute visited LLE to follow up on findings from NLUF experiments carried out on the Omega Laser Facility. These high-energy-density physics experiments have been used to replicate astrophysical phenomena observed by the Hubble Space Telescope. Various coil designs have been utilized in experiments with magnetized ICF targets using the magnetic field generator MIFEDS. Shown are four different coil shapes, ranging in size from 6 to 16 mm, superimposed on an image of a target shot (OMEGA S/N 59300) which utilized one of these coils. Inside the target chamber, the shot image measures about 0.9 m across. Additional information on the system may be found in this Around the Lab article. Sponsored by LLE, the first International Workshop on ICF Shock Ignition was held on 8–10 March 2011. Representatives from institutions worldwide interested in shock ignition visited LLE to discuss the current status of a variety of topics, including: facility forecasts; target design and simulations; and the effects of laser–plasma interactions during a shock-ignition implosion. Plans for the next workshop, to be held in the fall of 2011 at either IFSA or APS, are already underway. 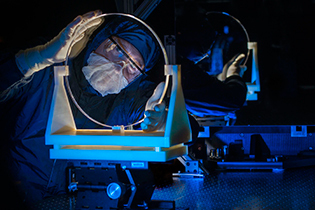 As part of the optics maintenance program, LLE's Optical Manufacturing group monitors and prepares large optics for integration into the Omega Laser Facility. Here, a cluster of three optics undergoes inspection. Nearest the inspector is the vacuum window, followed by the focus lens (center), and the ultraviolet diagnostic beam splitter (UV DBS). The first two optics comprise an OMEGA EP final optics assembly. 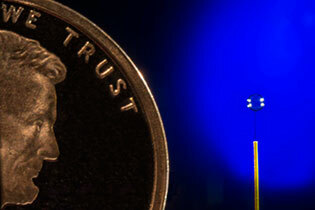 The UV DBS is used to reflect 4% of the beam to a diagnostic chain. 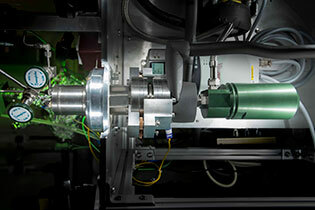 The south pole bang-time detector is used to determine the bang time along the hohlraum axis as one of the National Ignition Facility's diagnostics used for the National Ignition Campaign. This is essential in understanding the time it takes to illuminate a target and come to a fusion peak. 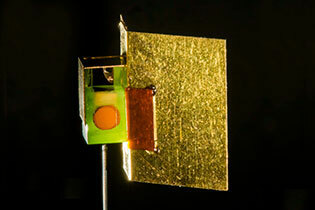 Diamond x-ray detectors and graphite crystal mirrors are enclosed by a Hevimet housing completely fabricated at LLE. LLE has developed a monochromatic x-ray imager for backlit and self-emission plasma imaging at Cu Kα line radiation at 1.541 Å (8.048 keV) . 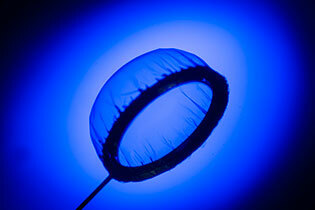 The image is formed by a spherically bent quartz crystal with a diameter of 25 mm and a curvature radius of 500 mm. The crystal acts like a focusing spherical mirror forming an x-ray image with a very good spatial resolution. Dr. Eric Toone, Deputy Director for Technology for the Advanced Research Projects Agency, recently visited the Laboratory. He is shown in the OMEGA EP viewing gallery where Dr. D. D. Meyerhofer (LLE Deputy Director) and Mr. S. F. B. Morse (Omega Laser Facility Director) are describing the laser system. The zirconium Neutron Activation Diagnostic (Zr-NAD) is one of several diagnostics that have been developed, designed, and/or engineered by LLE for the National Ignition Campaign. This diagnostic will use nuclear activation of a zirconium foil to measure the primary neutron yield from implosions of DT fuel. The device was designed to place the zirconium foil at a precise distance from the imploding target, resulting in an accurate neutron yield measurement. Barry Xu (right) was named a semifinalist in the 2011 Intel Science Talent Search. Xu, advised by scientist Suxing Hu (left), is a student at Brighton High School. He worked on an improved model for the transfer of energy between electrons and ions in LLE's implosion experiments. The Science Talent Search is often referred to as the "Junior Nobel Prize" and is the country's most prestigious science scholarship competition. Since its inception in 1989, LLE's summer research program has produced 29 semifinalists and 4 finalists. Application forms for the 2011 program will be available on this Website in early February. The annual meetings of the Optical Society of America and the American Physical Society Division of Laser Science occurred in Rochester, New York. Visitors from 17 countries attending OSA's Frontiers in Optics 2010 and DLS's Laser Science XXVI toured LLE on the day after the joint conference to celebrate the 50th anniversary of the laser. 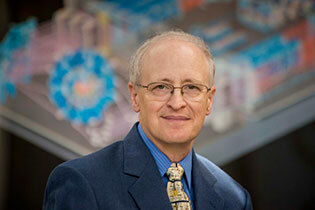 SPIE interviews LLE Director Dr. Robert L. McCrory on the 50th anniversary of the Laser. SPIE conducted a video interview with LLE Director Dr. Robert L. McCrory where he discusses the role of the LLE on the 50th anniversary of the invention of the Laser. Sponsored by LLE, the International Committee on Ultra Intense Lasers (ICUIL) held its 4th biennial meeting in Watkins Glen, New York. Representing 17 countries, 95 of the almost 150 participants are shown with the ICUIL board. ICUIL provides for international collaborative activities in developing the next generation of ultrahigh-intensity lasers. Thomas Jones, Professor of Electrical Engineering at the University of Rochester, demonstrates ignition of acetone vapor as part of a presentation to the students in the Summer High School Research Program. Because of the two-second exposure, one sees both the rising fireball and the spark that initiated the ignition. When it comes to safety, those attending the 22nd Annual High School Summer Research Program satisfy the same requirements as every new hire at LLE. Each student is required to satisfactorily complete one or more of the nine safety trainings before beginning participation in the program. Shown is Dr. Walter Shmayda, radiation safety officer, beginning the first of five lectures on radiation safety. Dr. Steven Koonin, the U. S. Department of Energy Under Secretary for Science, met with the Director, Dr. Robert McCrory, the Associate Director for Operations, Capt. Steven Loucks (USN-Ret), as well as, division directors, scientists, and students during his recent visit to LLE. A team from Commissariat à l'énergie atomique (CEA) recently visited LLE to discuss the build progress of the Laser Mégajoule laser system and exchange technical information on thin-film coatings for high-peak-power laser applications. CEA is collaborating with LLE's Optical Manufacturing group on large-area optical coating development for a deformable mirror component. Novel gas membranes that demonstrate variable permeability when illuminated with different wavelengths of light have recently been developed at the Optical Materials Laboratory. These are based on light-sensitive liquid crystals, synthesized at LLE, and absorbed into micropores of a thin plastic sheet. Shown is one of the developers, Eric Glowacki, preparing a membrane for testing using a custom-built permeation measurement tool. K. L. Marshall and E. Glowacki, "Photo-Switchable Membrane and Method," U.S. Patent No. 8,435,333 (7 May 2013). The June 2010 issue of Physics Today magazine includes an article on high-energy-density physics by Paul Drake from the University of Michigan. The front cover features an image taken for his experiment from inside the OMEGA target chamber. Physics Today, the flagship publication of The American Institute of Physics and the most influential and closely followed physics magazine in the world, is delivered to more than 120,000 readers. To see the full article, visit the Physics Today web site. A fisheye view of the OMEGA EP target chamber (with the laser beamlines to the right) shows off the last of the three Off-Axis Parabola Inserter/Manipulators (OAPI/M'S) to be installed at the Omega Laser Facility. Previously highlighted in the 2/01/10 Quick Shot, the Gate Valve Electrical Drive is installed on the upper left side of the gate valve, just left of photograph center. An Off-Axis Parabola, previously shown in the 8/11/08 Quick Shot, is maneuvered by an OAPI/M inside the target chamber. The second Omega Laser Users Group Workshop, held 28-30 April 2010 attracted 115 researchers from 19 universities, 21 Centers and laboratories, and 5 countries. The purpose of the workshop was to facilitate communication and exchanges among the individual users and between the users and LLE. Sixty presentations highlighting on-going and proposed research experiments were given, most of which were presented by the 45 students and postdoctoral candidates in attendance. Plans for the next workshop, to be held 27-29 April 2011, are already underway. The increased computing power of the new Dell computing cluster makes it practical to program hydrodynamic models using a finer resolution than previous systems. Because individual nodes can be taken out of service while the rest of the cluster continues to process jobs, the distributed architecture of the cluster improves reliability. Shown is Tony Brancato performing diagnostic tests on one node of the 72-node cluster. The first application of fusion welding a copper tank has been used in Target Fabrication as enhancements continue to be designed and incorporated into LLE's cryogenic program. The unique technique used in-house to make pressure vessels without seams has been successfully applied to elements of planar cryo. These pressure vessels are used to store the fill gas for a variety of planar cryogenic targets. The upgrade will reduce the amount of maintenance and improve long-term reliability over a larger number of uses. Shown in LLE's machine shop is Dale Guy whose helmet design is illuminated by the weld's intense light. Atomic Force and Nomarski microscopes are mounted side-by-side on a large gantry to examine the surfaces of large holographic diffraction gratings. Shown in reflection are Charles Kellogg and Kevin McGowan, from the Optics and Imaging Sciences Group, examining a prototype grating manufactured by the Plymouth Grating Laboratory. Accurate characterization of the grating pillars and surface defects is crucial to establishing a manufacturing process leading to laser damage resistant gratings. The Science and Technology Seminar series, hosted by LLE for over 25 years, features weekly presentations to LLE staff from experts in their fields. Recently, Tina Oldknow, Curator of Modern Glass at the Corning Museum of Glass, presented a talk on a contemporary art exhibition. She is shown with Jake Bromage who, along with Igor Igumenshchev, have secured speakers for this year. A listing of upcoming and past seminars is available here. Harvest Zhang was named semifinalist in the Intel Science Talent Search 2010. Zhang, advised by Lance Lund, is a student at Brighton High School. His research included work on LLE's cryogenic targets. The Science Talent Search is often referred to as the "Junior Nobel Prize" and is the country's most prestigious science scholarship competition. Since its inception in 1989, LLE's Summer Research Program has produced 28 semifinalists and 4 finalists. The deadline for applications to the 2010 Summer Research Program is Wednesday, March 24 at 5 pm. A view through a window in the Optical Manufacturing Group's 72-in. coater shows an optic (SPHR10) in the upper left with plasma and evaporation sources below. 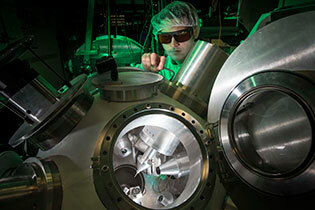 Dual-plasma sources are used to provide stress control for optical coatings used in vacuum. The 0.8-m high-reflector mirror is the first production optic coated with the plasma-assist technology at LLE, and it will be used in the short-pulse transport section of OMEGA EP. OMEGA is used by many researchers from around the world to perform cutting-edge research and to train highly talented students. Shown are Carolyn Kuranz, Research Scientist, and Christine Krauland, Doctoral Student, from the University of Michigan's Center for Radiative Shock Hydrodynamics (CRASH). 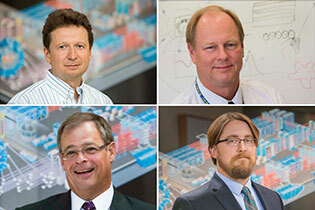 Under the guidance of R. Paul Drake, these researchers routinely perform experiments in support of their program. The Gate Valve Electrical Drive (GVED) was recently developed at LLE. The GVED improves safety by removing the air cylinder's stored energy potential and prevents possible sudden changes in physical location. Although the required power to run the drive is less than 15 mW, the GVED produces 2910 ft-lb of torque. For comparison, a heavy-duty-series 600HP tractor-trailer produces only 1850 ft-lb of torque. To assist LLE in forging an invigorated Counterintelligence Program we announce that the Brookhaven Field Office, which serves the DOE's Northeast Region, will be represented by Deputy Senior Counterintelligence Officer Phillip V. Sarcione, Senior Counterintelligence Officer Randy M. Biegelman, and Counterintelligence Officer Paul M. Moskal, pictured respectively above. A 900-µm-diameter polymer target with an embedded gold cone is filled with liquid D2 via a thin support tube connected to a fuel reservoir (left). The target will be studied in the Cryogenic Fill-Tube Target Facility. The objective is to form a uniformly-thick 100-µm solid fuel layer on the inside of the plastic capsule by overcoming the thermal distortion caused by the gold cone. Gold-plated copper components for the Moving Cryostat Upgrade have highly polished surfaces to create a low surface emissivity. This reduces the radiation heat load to the cold head and reduces the need for multi-layer insulation. The Nuclear Diagnostic Inserter (NDI) is used in conjunction with the Magnetic Recoil Spectrometer to insert CD or CH foils, which provide a particle spectrum that is used to infer target areal density. These new NDI's will be used to insert wedged range filter modules for various experiments. Brigadier General Garrett Harencak, NNSA principal assistant deputy administrator for military application, toured the Omega Laser Facility less than one week after researchers highlighted recent advances in NNSA-sponsored high-energy-density physics research at the 51st Annual Meeting of the American Physical Society, Division of Plasma Physics (APS/DPP). The mechanical assembly of the antechamber on the OMEGA EP sidelighter has been completed. Shown is a partially assembled service trailer that includes two cable carriers. The first carrier allows the trailer and second carrier to travel half way. The trailer then stops where the second carrier extends, allowing the OAPI-M to reach its position inside the OMEGA EP target chamber. LLE hosted the 7th International Laser Operations Workshop in October 2009. Laser operations staff from the major U.S., U.K., and French laboratories exchanged ideas to address common issues and safety concerns, and collaborated to develop best practices to benefit all Laser Facilities. 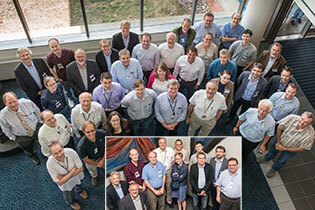 Delegates from LLNL, LANL, SNL, AWE, RAL, CEA, and LULI participated. Looking southwest from the target area structure, amplifier housings are lit as OMEGA EP's four beams fire. With no bay lights on, the beamline structures are illuminated by the flash of light that energizes the laser amplifiers. The grating compressor chamber can be seen in the shadows at the right. Participants in the 2009 LLE Summer High School Research Program with program director, Dr. Stephen Craxton. 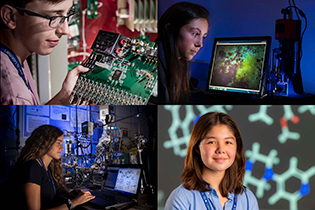 The Summer High School Research Program challenges high school students to explore research topics and careers under the tutelage of LLE scientists, engineers, and staff in a state-of-the-art environment. This year's program concluded last month with student presentations of their results at a symposium in the laboratory. Colorful spectral dispersion is observed through diffraction from a multilayer-dielectric grating. Several large-aperture diffraction gratings are used to compress the pulse width of the OMEGA EP short-pulse laser beams. LLE is investigating high-damage-threshold grating designs and manufacturing processes to increase the energy delivered to target. The final phase of installing the Grating Inspection System is shown inside OMEGA EP's Grating Compression Chamber. Two GIS systems will be used to perform detection scans of damage sites on both upper and lower tiled-grating assemblies fourth TGA. The image of TGA1 (left) is shown reflected off the Fizeau Selection Mirror (right). Students taking a tour of LLE look at the OMEGA EP Laser Bay from the Viewing Gallery. The students are working on the Multi-Channel Carbon Counter and studying under Dr. Stephen Padalino of SUNY Geneseo. A panoramic view shown in 360 degrees of the OMEGA EP Target Bay facing the Target Area Structure. Full-aperture interferometry is an essential tool in characterizing large-aperture optics for OMEGA and OMEGA EP components. A grating tile manufactured by Plymouth Grating Laboratory (PGL) is shown being aligned for evaluation on a Zygo 18-in. phase-shifting interferometer and is also seen in the high-reflector, flat mirror. After being poured into a form for the counter's side shield, molten lead at 800°F is shown being "puddled," a process originally used to make steel from pig iron. During the process, cooled lead is heated, or torched in this case, liquifying it to sink and fill in any trapped air holes. At the same time, additional molten lead is being added to maintain the volume. The dual plasma source system is used in conjunction with an electron-beam deposition process in order to densify coatings and modify film stress, resulting in coatings with broad environmental stability. 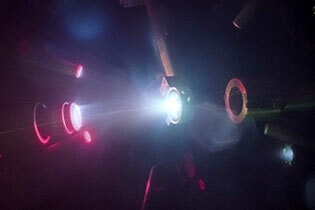 This process is currently under development in the Optical Manufacturing Group at LLE, and is shown here being tested with an argon plasma in the 72-inch coating chamber. The first Omega Laser Users Group Workshop, held April 29 – May 1, 2009 attracted 110 researchers from 29 universities and laboratories and four countries. The purpose of the workshop was to facilitate communication and exchanges among the individual users and between the users and LLE. Almost fifty presentations highlighting on-going and proposed research experiments were given, most of which were presented by the thirty-two students and postdoctoral candidates in attendance. National Geographic magazine's special issue: Energy for Tomorrow: Repowering the Planet features an image from inside the OMEGA target chamber during a target shot. Repowering the Planet focuses on the current energy landscape and what it might look like in the future. Photograph taken inside the OMEGA target chamber during an NLUF experiment led by a team from MIT's Plasma Science and Fusion Center. Employing proton radiography, the experiment studied jet formation using the target featured in the Quick Shot posted 3/25/09. The LLE held a blood drive for the Red Cross. In all, 43 employees presented themselves for blood donation, resulting in more than double the expectation of usable units of blood. 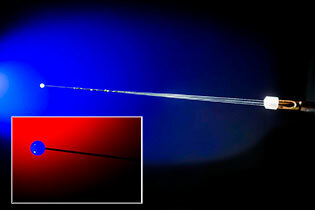 A target used for an OMEGA NLUF experiment carried out by a team from MIT's Plasma Science and Fusion Center to study jet formation using proton radiography. The large, 20-mm-diameter, conical structure is used to shield the diagnostic systems from x-ray radiation generated by the laser beams that are used to form the jet in the foam cylinder behind the cone. An LLE Laboratory Engineer and MIT graduate student remove the proton-sensitive recording media from the Magnetic Recoil Spectrometer, the primary fuel compression diagnostic for OMEGA cryogenic DT experiments. A crew from the Discovery Channel prepares to film in the OMEGA Laser Bay. The director of photography is crouched down looking at the real-time feed, and the motion-control operator raises the camera into the air with the sound technician next to him. 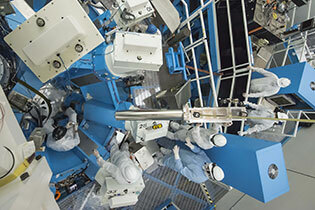 The last of the spare NIF polarizer optics are coated in the 72-inch chamber. 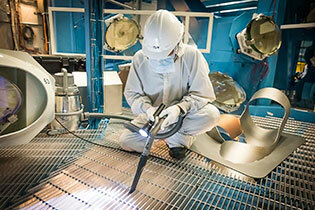 This marks the completion of an eight-year NIF large-optic coating production phase. Rachel Kurchin and Jay Amin were named semifinalists in the Intel Science Talent Search 2009. Kurchin, shown left with advisors Stephen Craxton and Mark Wittman, is a student at The Harley School. Amin, shown right with advisor Christophe Dorrer, is a student at Rush Henrietta Senior High School. The Science Talent Search is often referred to as the "Junior Nobel Prize" and is the country's most prestigious science scholarship competition. Commissariat à l'énergie atomique (CEA) team (left to right: Oliver Landoas, Jean-Luc Bourgade, and Cédric Courtois from DAM lle de France, Bruyères le Châtel) participating on the first joint experiments on OMEGA EP for characterizing MeV photon generation under short pulse (0.6 ps) and powerful (0.5 PW) laser irradiation on a solid target (Au). The lower housing of a neutron time-of-flight (nTOF) detector is shown shortly after being machined at LLE. 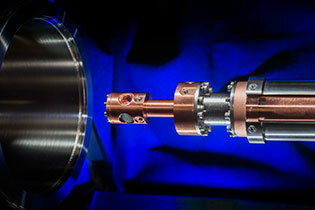 The completed nTOF detector will be used to obtain ion temperatures from integrated fast-ignition experiments on OMEGA. 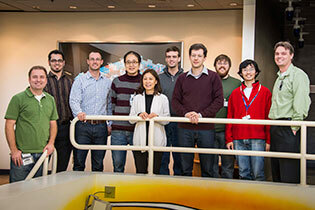 A team from the University of Michigan carried out experiments on radiative shock hydrodynamics on OMEGA in October. On September 16, 2008, an OMEGA EP beamline irradiated a target with an energy of 1415 J in an 11-ps laser pulse. This energy is more than a factor of two higher than any previously obtained with a short-pulse laser system. The LLE has created a book for readers of all backgrounds to learn about and share the excitement of inertial fusion research. Visit the Publications page for more details and to download a copy. 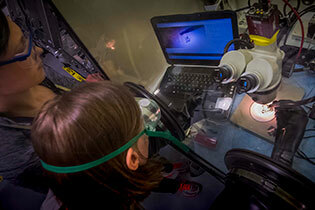 High school student Rachel Kurchin (The Harley School) examines a spherical target inside a glass hohlraum. Rachel is one of 15 students participating in this year's LLE Summer High School Research Program. See next month's Around the Lab section for an in-depth look at the students' projects. The off-axis parabolic optic was installed onto the off-axis parabola inserter/manipulator at OMEGA port H7. The optic was installed for joint OMEGA and OMEGA EP shots in support of advanced ignition development. The second set of beam-delivery optics to the OMEGA EP target chamber was aligned and initial target shots were taken during the week of June 30. The OMEGA EP target chamber is shown illuminated by the second-harmonic (527-nm-wavelength) green light generated when the high-intensity (> 100 J in a 10-ps pulse) infrared laser hit the target. The final focusing optic, an off-axis parabola, is seen on the right-hand side of the image. A view of the entire OMEGA EP upper compressor inside the grating compressor chamber (GCC). The four tiled-grating assemblies (TGA's) are prominent in the right half of the picture. In the inset is the team that fielded two full-scale tiled-grating compressors in the GCC on OMEGA EP. Both compressors achieved less than 1ps pulse width. On Monday, June 23, 2008, coworkers and friends gathered to celebrate the retirement of Captain Steven J. Loucks, Deputy Director of the Laboratory, Director of the Engineering Division, and OMEGA Facility Director. Loucks has been with LLE since 1990. The NIF PAM arrived at LLE for integration into the OMEGA EP Laser System.